After our last session of birding the blinds at Baihualing and lunch, we drove for three hours to Tengchong. The next morning, January 27, we birded Laifengshan National Forest Park. 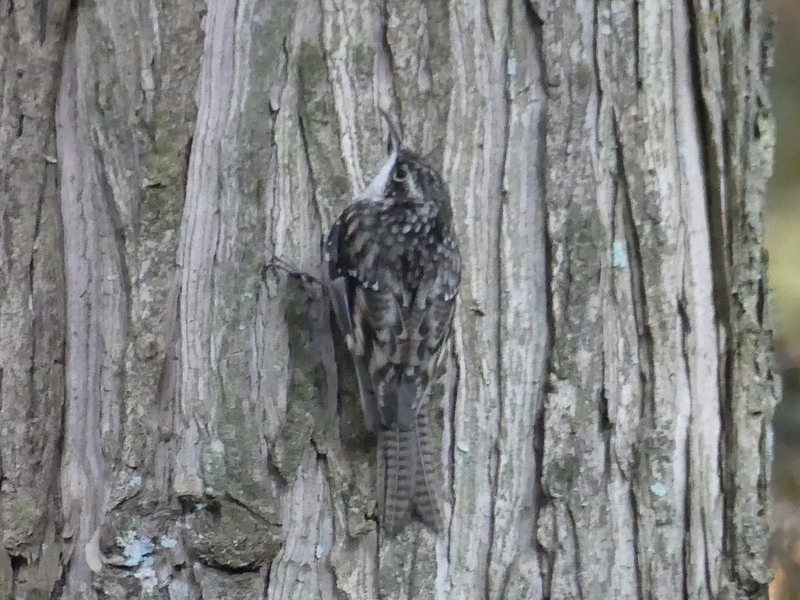 The first birds we saw were two Bar-tailed Treecreepers, which I thought looked an awful lot like my Brown Creepers at home. Laifengshan is a popular park and visitors that day included several Chinese bird photographers. 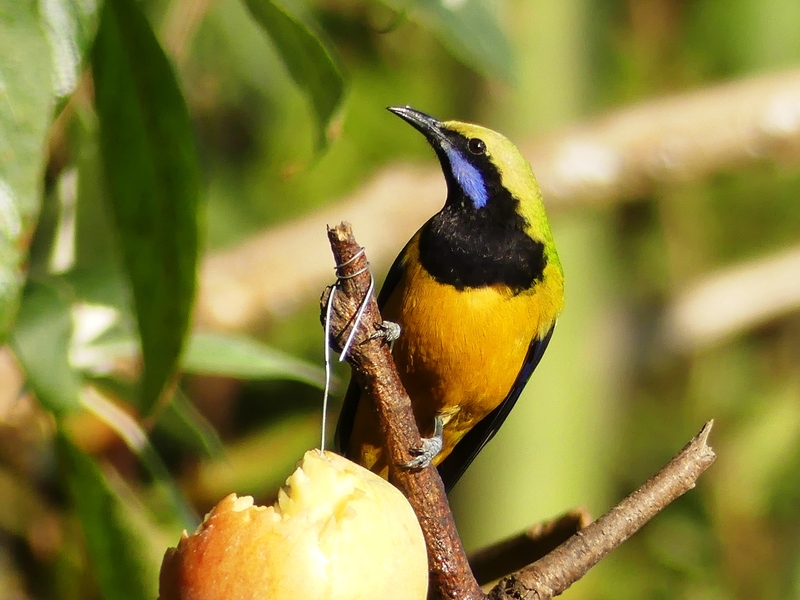 I was able to get the photo below of a Slender-billed Oriole after a young Chinese woman with a camera excitedly showed me the bird, one of our main targets here. When I had asked Nick about field marks for the oriole, he said that the black mask goes all the way around the nape. Although my photo isn’t great, I was excited that it so clearly shows that key field mark. The park was very pretty and it was a gorgeous sunny day. 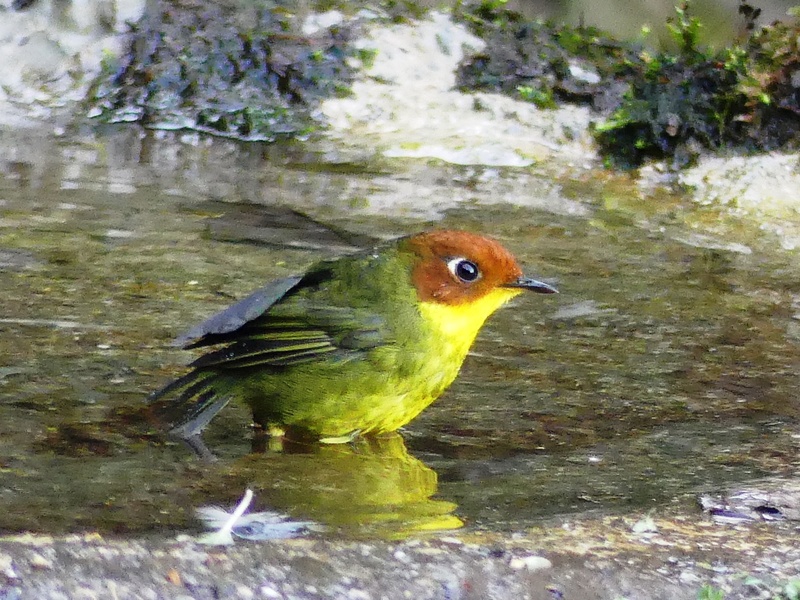 While walking up to the temple we saw some nice birds including Rufous-bellied and Darjeeling Woodpeckers. 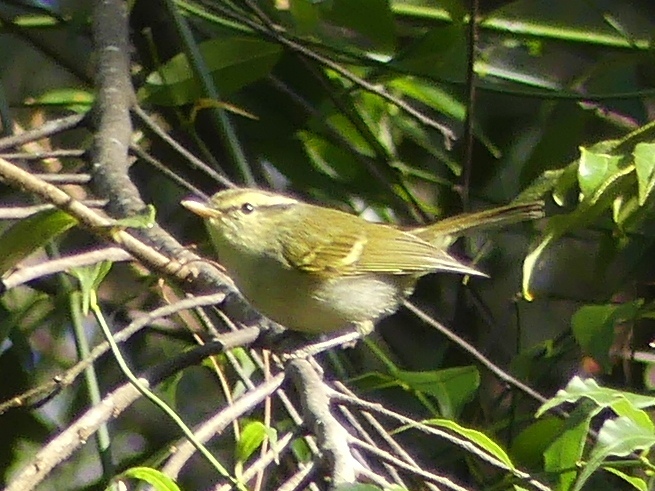 We also saw this Davison’s Leaf Warbler. Asian warblers are rather drab for the most part compared to our colorful North American jewels, however, I was still happy to get identifiable photos of several warbler species during our Yunnan trip. Shortly after noon, we left Tengchong for the drive to Nabang, where would spend the next 2-1/2 days. One of my favorite experiences in the Nabang area was time spent at a recently established photo blind/feeding station. We were walking along a forest trail when two young women on a motorcycle came by and said “Come see our blind.” The first half hour seemed to be a total waste of time as we saw absolutely no birds at all. Then, suddenly, birds began to arrive. 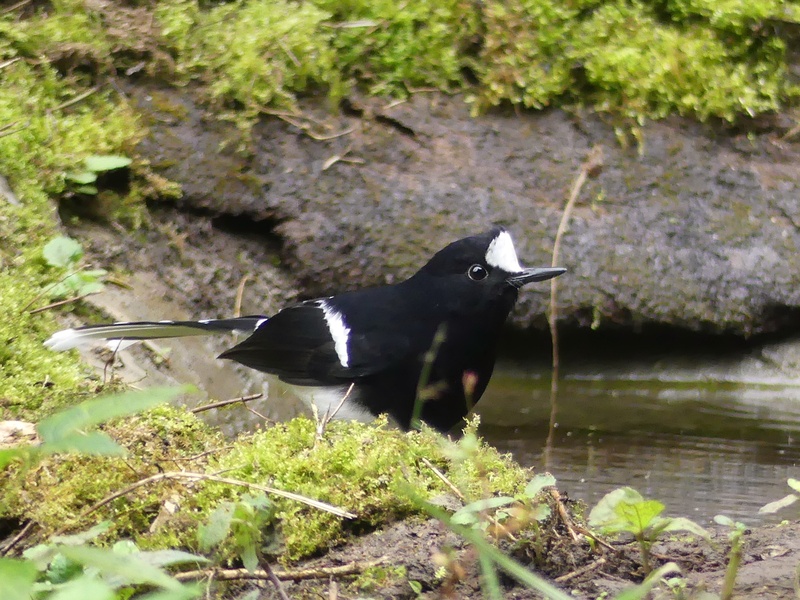 I was very, very happy to get wonderful close views of two gorgeous White-crowned Forktails that came in to the feeding area. This Rufous-bellied Niltava was another of my favorites. Velvet-fronted Nuthatch, Little Pied Flycatcher, and White-tailed Robin were among other species seen well at the blind. 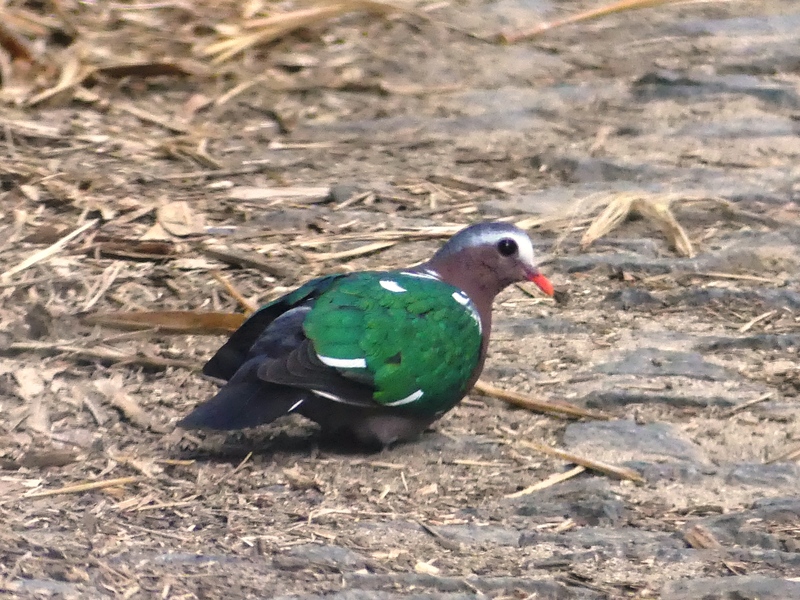 One our way back to the hotel that evening, the Asian Emerald Dove below was in the road in front of the bus. The others could not believe that this was a life bird for me. They seriously thought that I must have seen it before as it seemed a very common Asian bird to them. My bird was special, though, as it had extra white feathers. This species normally has white only on the face and front of the shoulder. We continued birding in the Nabang area for the next day and a half. On our last morning, we enjoyed this displaying Crested Goshawk, with the distinctive white undertail coverts fluffed up across the rump. In one of those quirks of birding, I have now seen this species three times, but I’m still looking for my life Northern Goshawk at home. It was then on to Ruili, the last destination of our birding tour. Early on our first morning there, we birded the trail to Moli Waterfalls, part of the Moli Scenic Area, one of the most beautiful locations we visited during the entire trip. One of our main targets was Streaked Wren-Babbler, a sneaky little bird as one would expect with both “wren” and “babbler” in its name. But, due to Nick’s patience and perseverance, I saw the little brown bird. Nick loves those skulky little brown birds, but I prefer big colorful birds like this Red-headed Trogon. 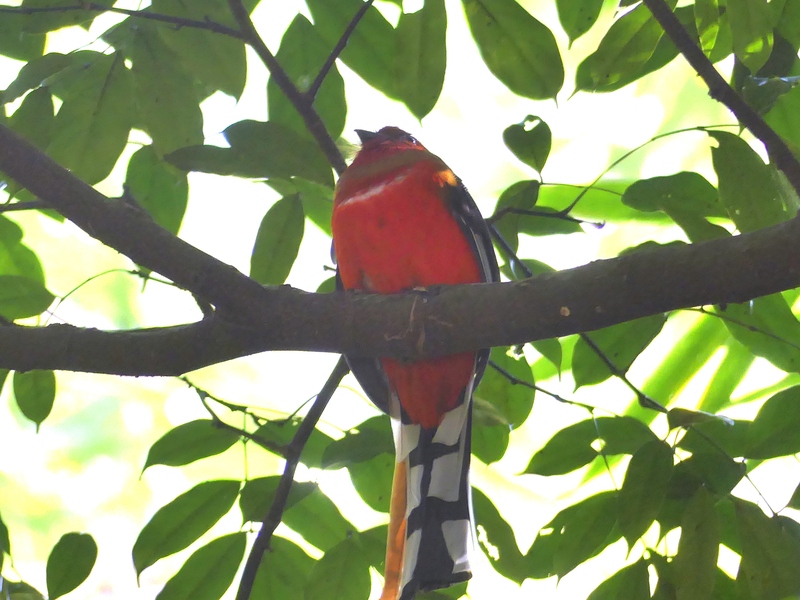 Before this trip, I thought of Trogons as primarily Central American birds, but I learned that they are residents of tropical forests worldwide. 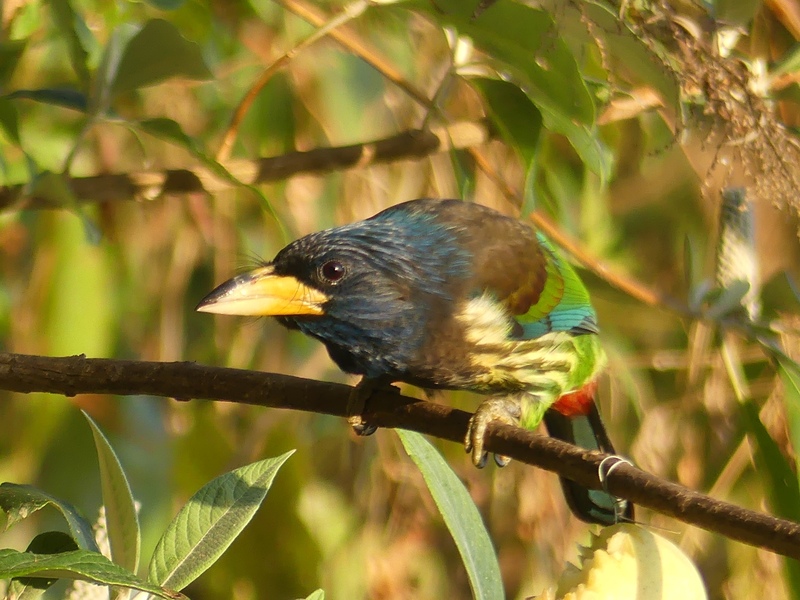 The greatest diversity is in the Neotropics, where 24 species occur, but there are also three African species and 12 species of Trogon found in southeast Asia. February first was the last day of birding for the tour. We started at a ridge-top road just outside of Ruili. 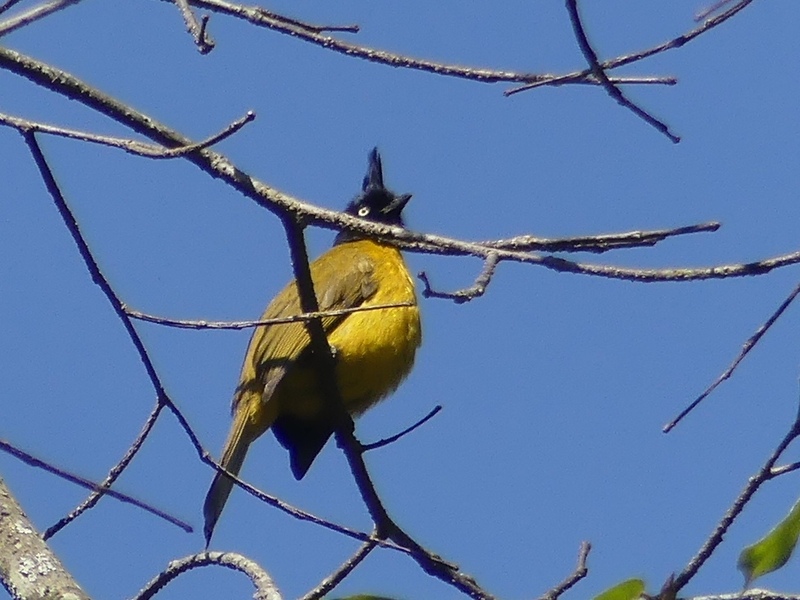 I picked up a few more life birds, including Black-crested Bulbul. But mostly, I just remember a lovely morning with pleasant companions, friendly farmers, and sunshine. I also remember watching drongos that morning, common birds in Yunnan with five different species seen during our two weeks there. I got 104 life birds on the trip, but I would have had more if I hadn’t missed so many birds due to my poor vision. Sometimes, when the others were focused on some distant or skulky bird that I couldn’t find, I just watched drongos, gracefully sallying out for insects and then resettling in the treetops. I was mesmerized by the graceful flights of these birds. 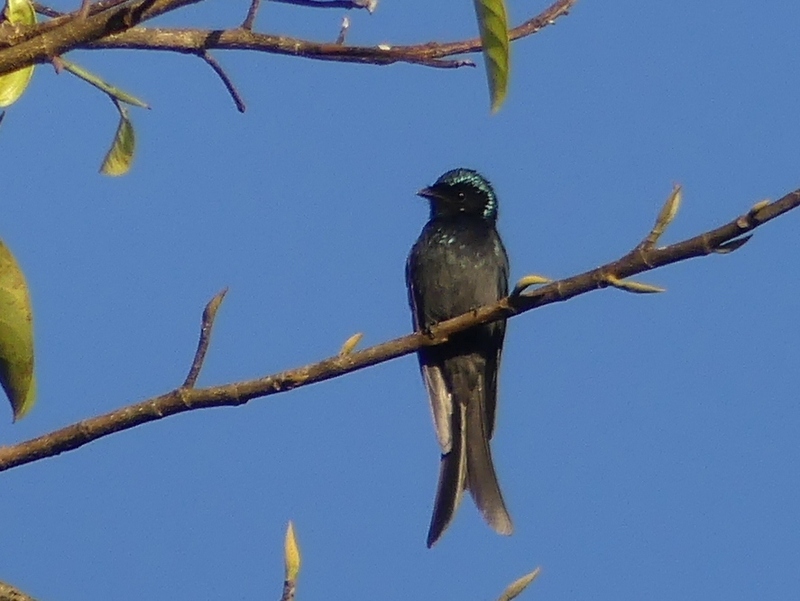 I thought that if you could cross a flycatcher with a swallow, you would get a drongo. And, then the morning was over and we piled back into the bus to start towards the airport. We stopped for lunch on the way at a lovely outside restaurant. While waiting for our food, someone noticed Asian Palm-Swifts flying low over the palm trees at the edge of the parking lot. This seemed like a bonus bird and very appropriate for my last China life bird. After lunch, we drove to the airport for our flight to Kunming. The next morning, the others would start their journeys home and I would fly to Shenzhen where I would visit my son, Dave, and his girlfriend, Rachel. 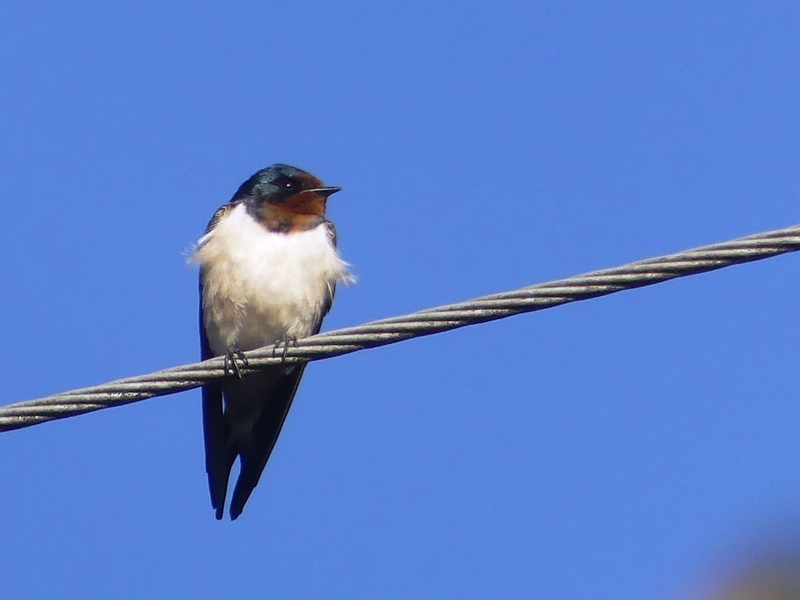 I love Barn Swallows with their white bellies in this part of the world. Parts of the trip were challenging, but I have no regrets. I saw a beautiful part of the world and many gorgeous birds. I enjoyed the company of birders far more accomplished than I will ever be. The other birders and our Zoothera Birding guide, Nick Bray, were fun and wonderfully kind about helping me see as many birds as possible. Near the end when I was getting tired, I thought that it would be my last trip to China, but now I don’t know if I can bear the thought of never again seeing the spectacular beauty of China’s birds. If I’d died and gone to birding heaven, it couldn’t have been much better than Baihualing. 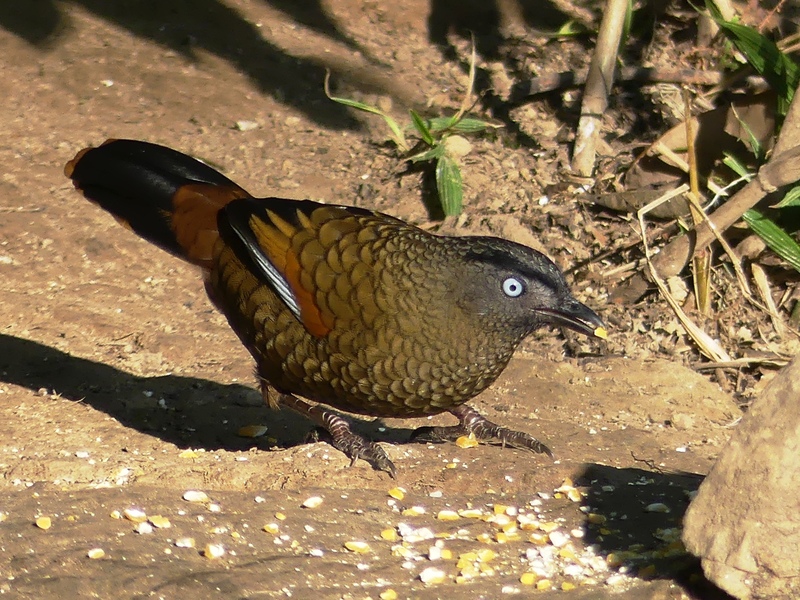 If you have been to South America and seen antpittas and other shy forest birds come to worms when called, imagine that. Except that it lasts all day rather than five minutes. The bird blinds/feeding stations at Baihualing are amazing. Each blind (or “hide” as the Brits say) is owned by a local who created and manages it. A good location is identified and then the blind owner creates a stage for the birds with water features, logs and stumps that can be filled with suet or worms, places to perch, etc. On one side is the hide – a narrow rectangular tent-like structure with either a long window or portholes for binoculars and cameras and little plastic stools for sitting. 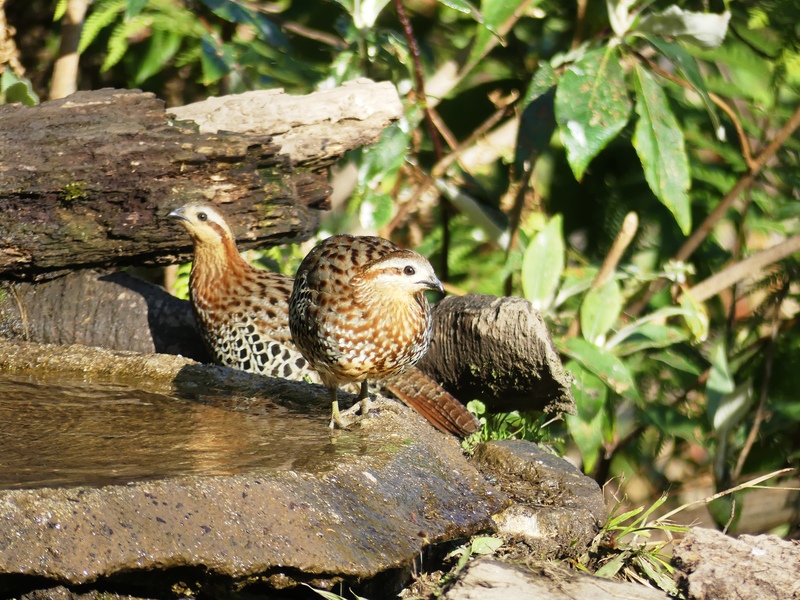 Everyone needs a drink, even shy species like these Mountain Bamboo-Partridges. I envision the creation process is much like that of a male bowerbird who looks at his stage from various perspectives. Will the birds find it appealing and come? Will the birders and photographers in the blind have good views? Ongoing management consists of chauffeuring birders back and forth between the hotel and the blind, feeding the birds throughout the day, and collecting the modest fees that birders and photographers pay for the privilege of wonderful close looks at birds that would otherwise be very difficult to find and see well. It’s a winning situation for everyone, including the birds. We arrived at this wonderful place late in the afternoon of January 23th and spent nearly two hours in Blind #8. Here are some of the gorgeous birds we saw that first day. 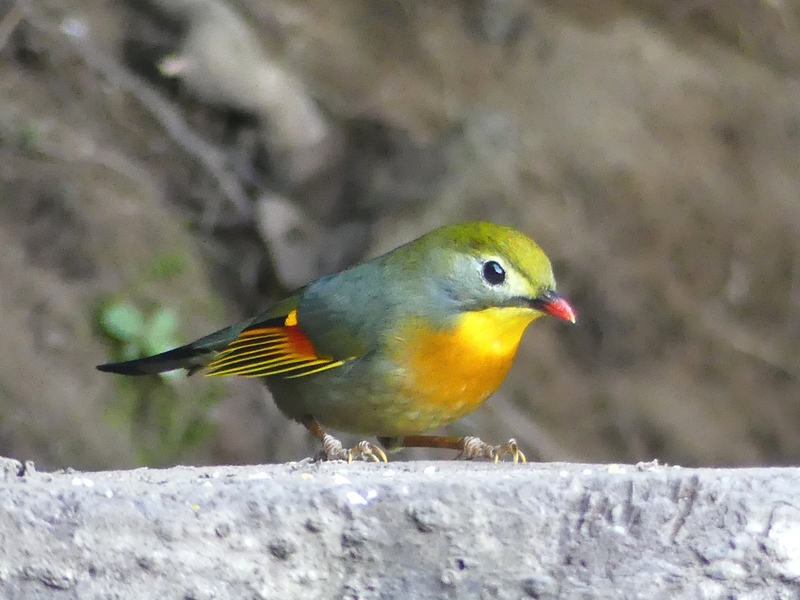 Red-billed Leiothrix. I missed this beautiful little bird on previous trips to China, so I was thrilled to finally get such a wonderful close look this time. 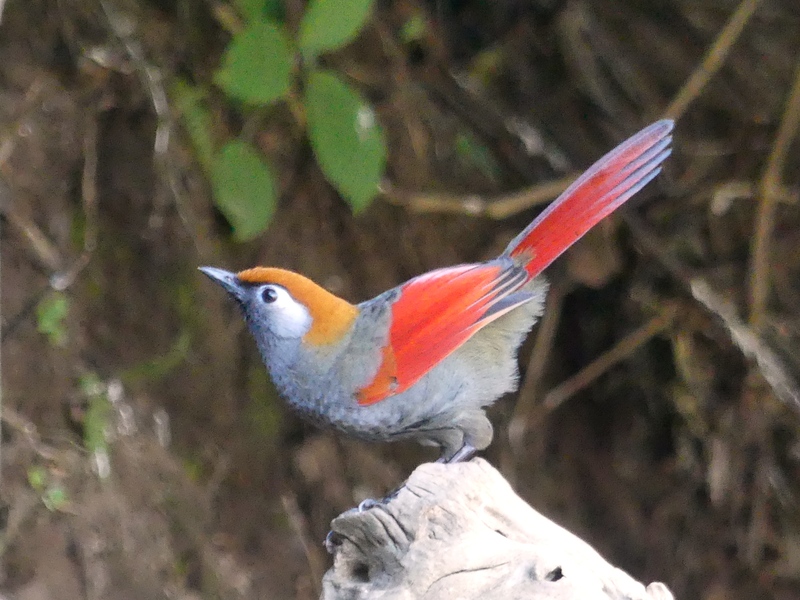 Red-tailed Laughingthrush. It’s hard to believe, but these beauties were common at the blinds with half a dozen or so frequently in the feeding areas. 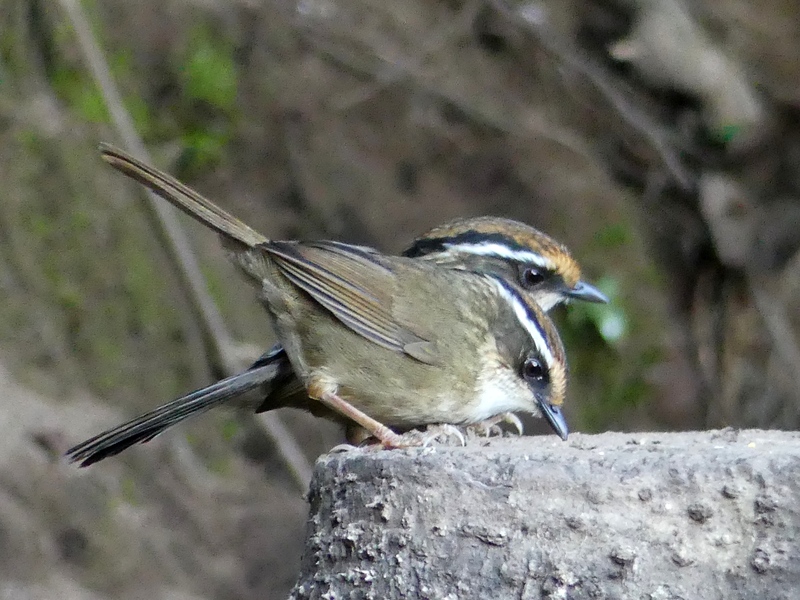 Rusty-capped Fulvettas. These little cuties were fun to watch. Space prohibits displaying all of my photos from that afternoon, so here is a link to my eBird checklist. The next morning we walked a nearby trail for over six hours. It was advertised as “flat,” but several of us thought it was a bit steep and I didn’t stay with the group the entire time. I didn’t see many birds on the trail, but I did see a beautiful Black Giant Squirrel which was so big that I didn’t even realize it was a squirrel at first. Later that afternoon, I was happy to spend two hours in Blind #77. In that short time, I got eight life birds! Here are a few of my favorite photos from the afternoon. Red-tailed Minla. Such a smart and sophisticated-looking bird. I can’t help assigning human-like personalities to some of these exotic Asian birds. 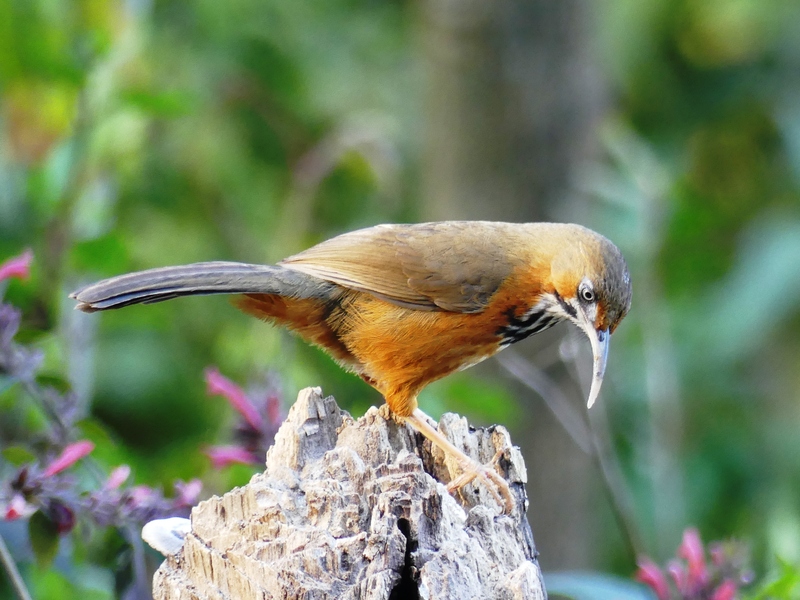 Black-streaked Scimitar-Babbler. I have been awed by scimitar-babblers ever since I first saw a Gray-sided Scimitar-Babbler in 2012. And, what a struggle it was to see that first one. 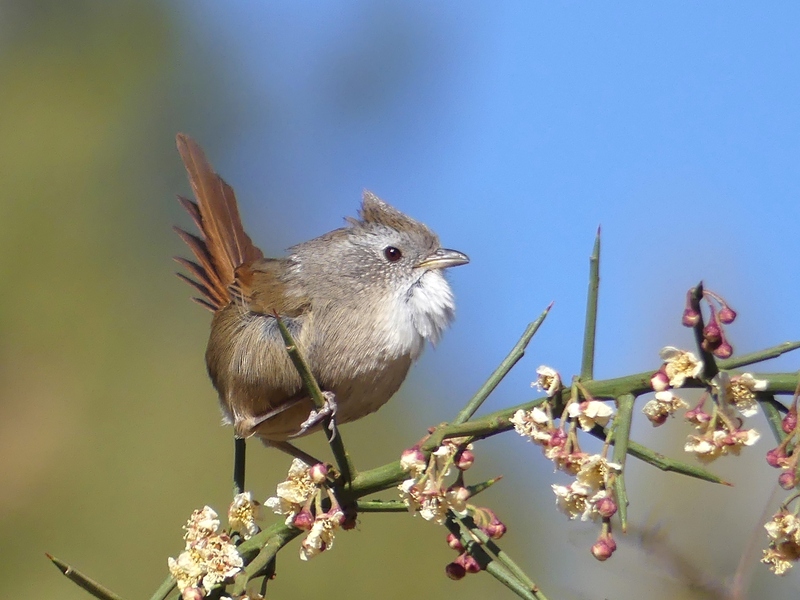 Scimitar-Babblers are normally very shy birds. 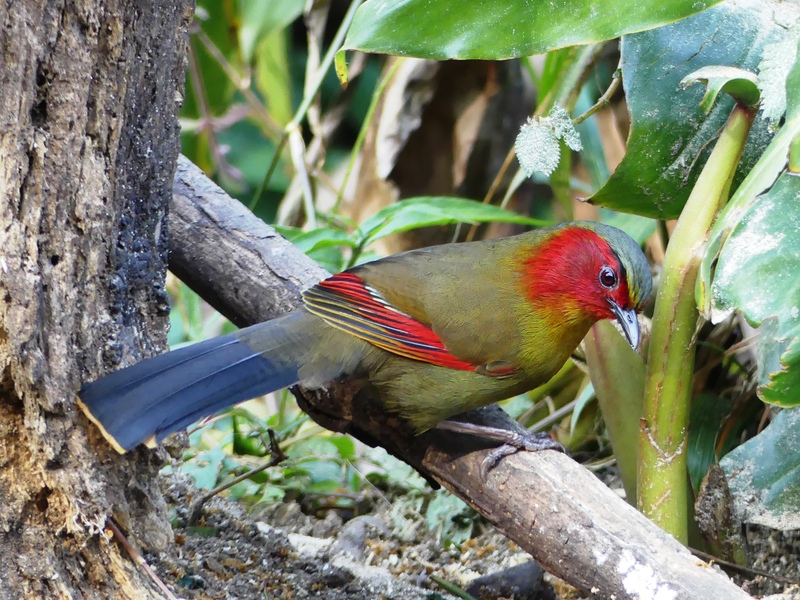 Scarlet-faced Liocichla. 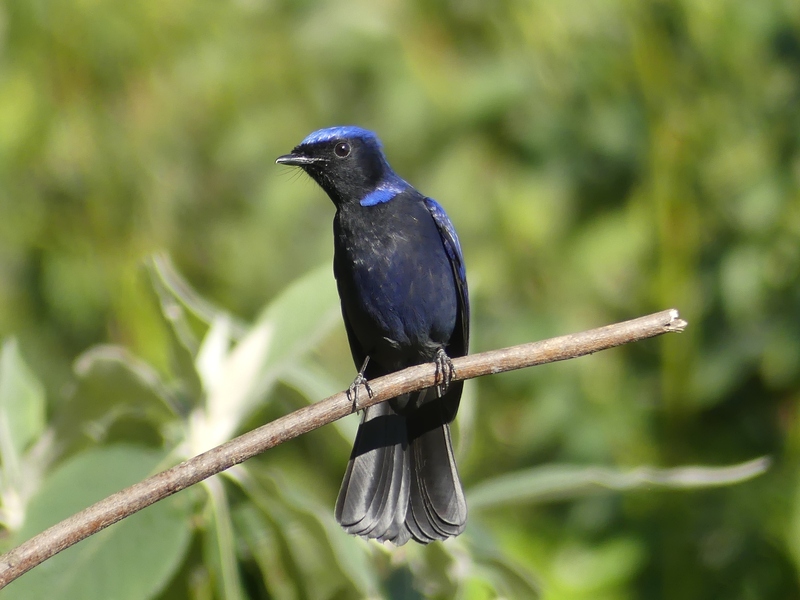 These gorgeous birds were fairly common and we frequently saw them with Red-tailed Laughingthrushes. And, here is my eBird checklist from that session with more photos. 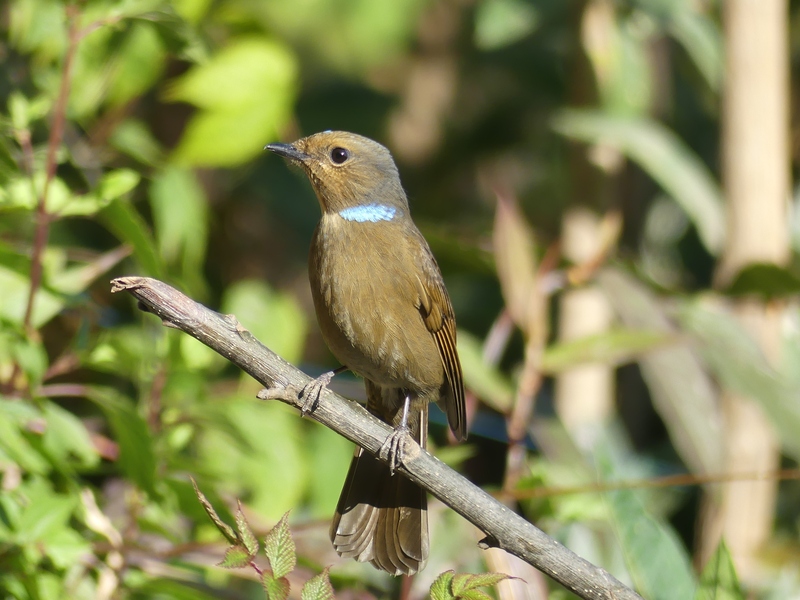 Blue-winged Lauthingthrush. Gorgeous and a little scary looking. 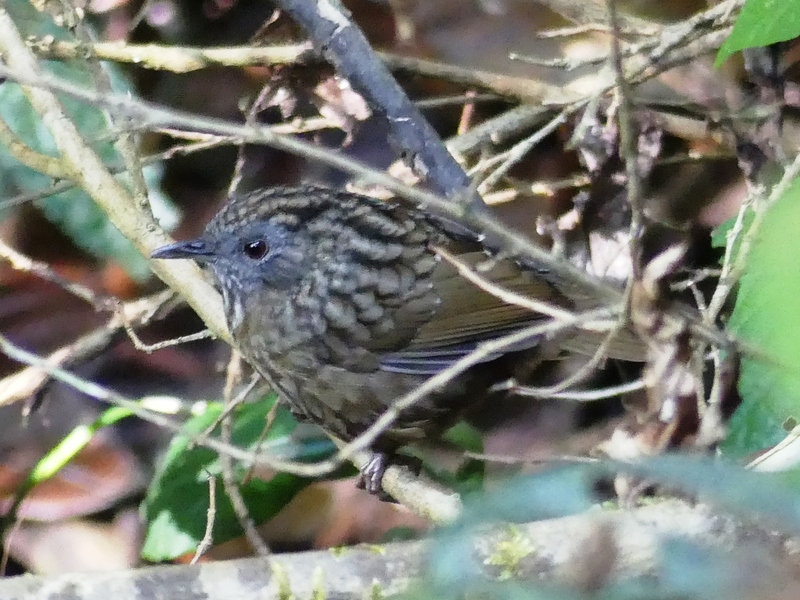 Very shy compared to Red-tailed Laughingthrushes. Ashy Drongo. He came into the feeding area like he owned it, with grace and confidence, but no arrogance. Yep, I can’t help those human comparisons. Drongos are common in China and the others didn’t get excited over them, but I loved them, especially this species. 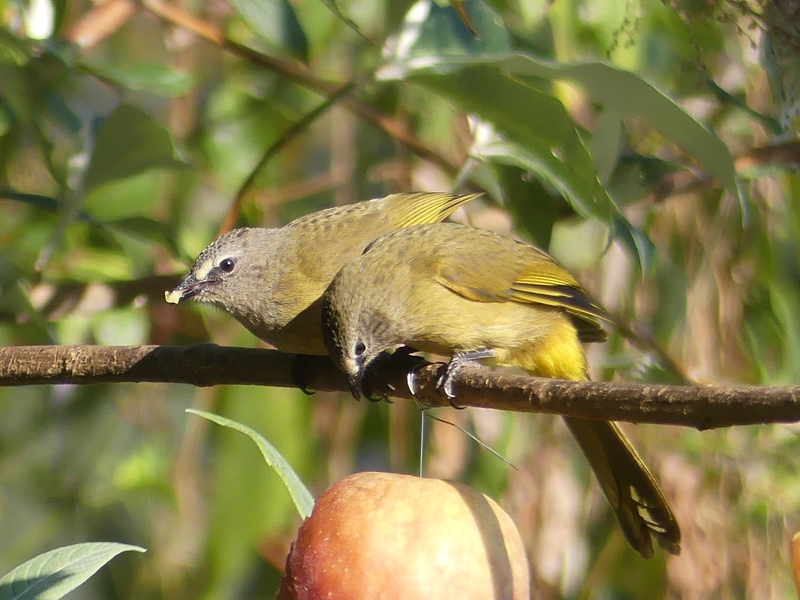 Flavescent Bulbuls enjoying an apple. 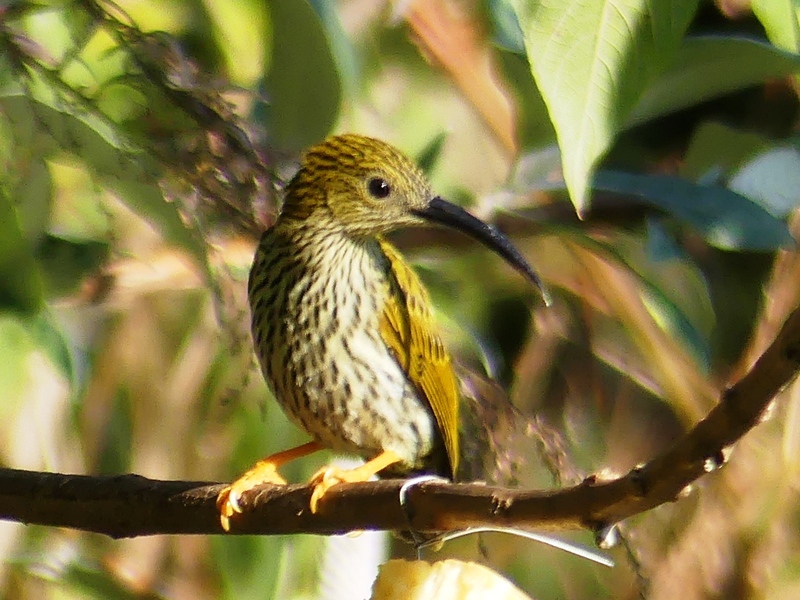 Streaked Spiderhunter is a species that we enjoyed seeing from the blinds, but this is one that we also saw well several times “in the wild.” Presumably, these birds do feed on spiders and insects, but that long curved bill is adapted for obtaining nectar. 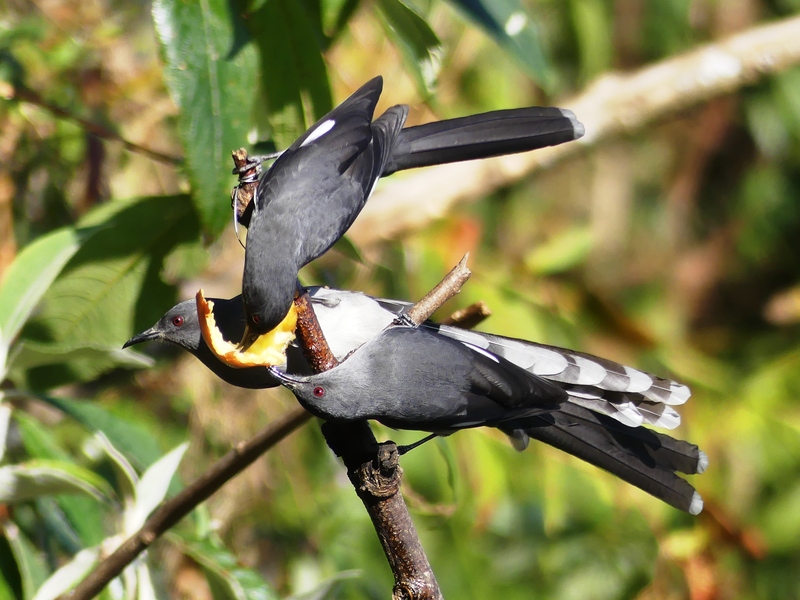 National Geographic even includes them in its list of Top 25 Birds with a Sugar Rush. 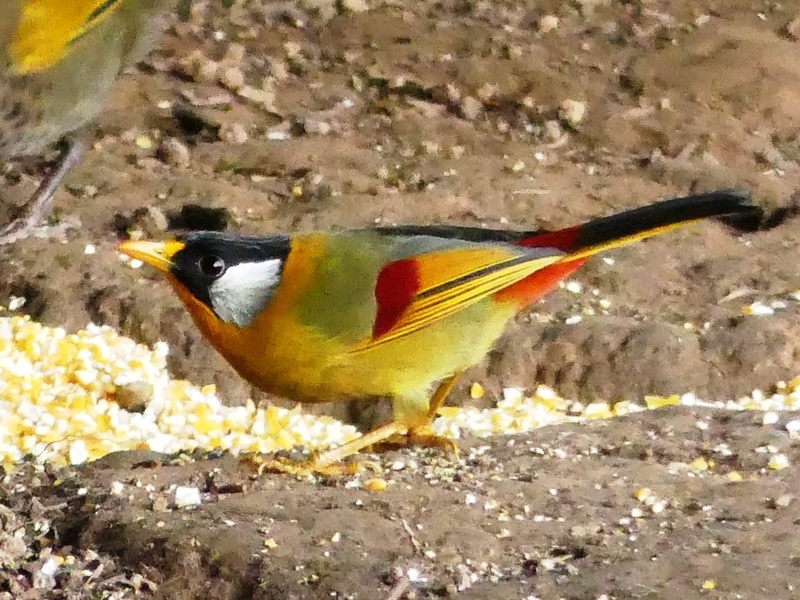 Silver-eared Mesia. These beautiful little birds are currently doing well in the wild, however, the population is under pressure from trapping for the caged bird trade. 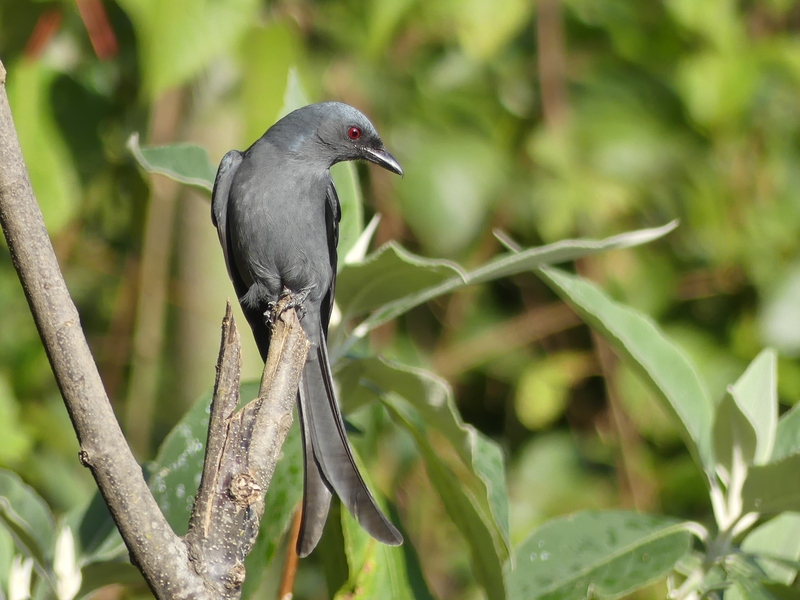 Long-tailed Sibia. 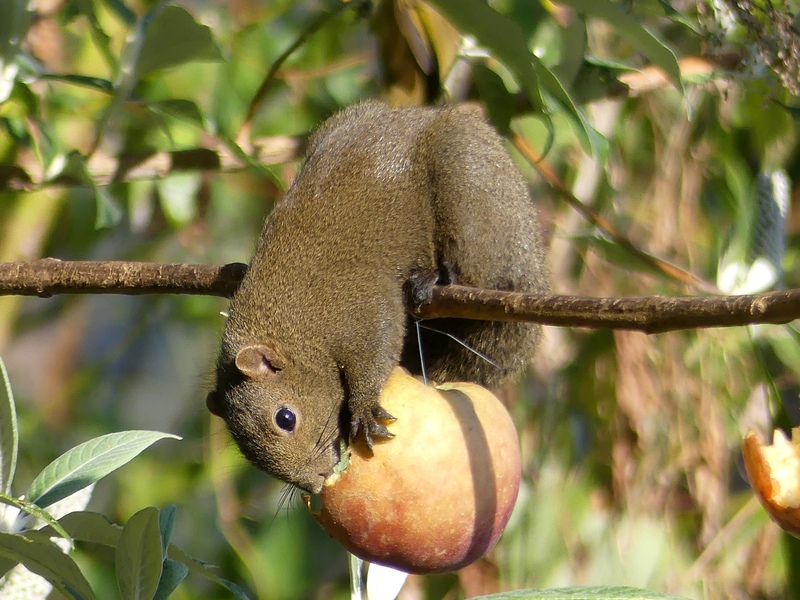 One of the many species that enjoyed the apples at the feeding stations. 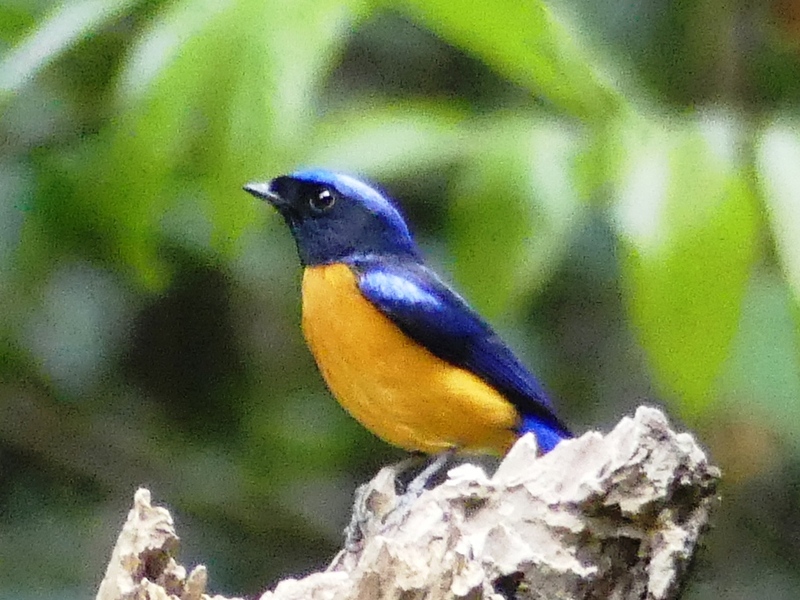 Large Niltava. This individual is a female. I think that she is just as gorgeous as her mate. Pallas’s Squirrel. These and Northern Tree Shrew were common visitors to the feeding stations. Here is my eBird checklist from the morning. We spent the afternoon in Blind #11, at a little higher elevation than the others we had visited, which produced a few new species. Each blind has its specialties. At this one, new birds were Hill Partridge and Gray-sided Laughingthrush. This blind was the only location where we saw either of these species. 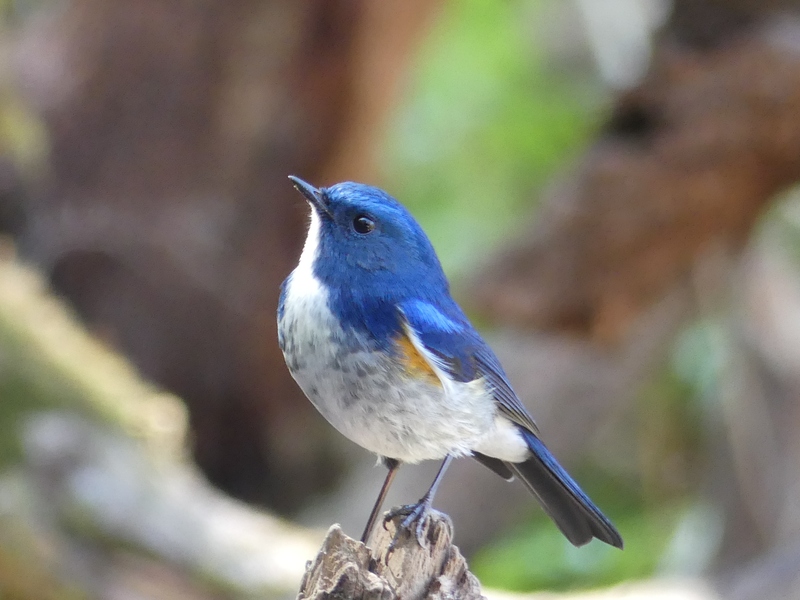 Himalayan Bluetail. Amazingly, we saw many of these beautiful birds. This one is a male. My eBird checklist from Blind #11 has more photos. On our final morning at Baihualing, we all had a choice – walk the trails to search for species that don’t come to the blinds or have another session at a blind. You can guess which option I choose. It turned out to be a good decision as the others dipped again on their second try for Gould’s Shortwing, a difficult species to find. Additionally, our little group in the blind had wonderful looks at eight Mountain Bamboo-Partridges, the only good sighting of this species during the trip. That last morning, we also had excellent looks at many species seen during the previous few days. A few of my favorites were the birds below. 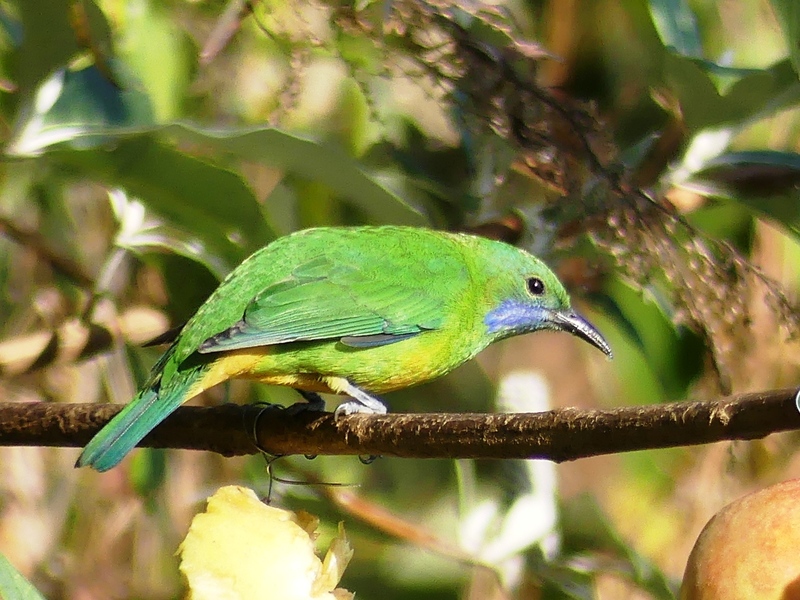 Mr. Orange-bellied Leafbird. I had seen these gorgeous birds on previous trips, but I was thrilled to get much closer looks this time. Here is my last eBird checklist from Baihualing, but there are six more days in the Zoothera Birding trip and then a week in Shenzhen, so I’ll be back with more stories. My son Dave visited Yunnan shortly after he moved to China in 2008. For years, he has urged me to see this province of China that is often considered the most beautiful. 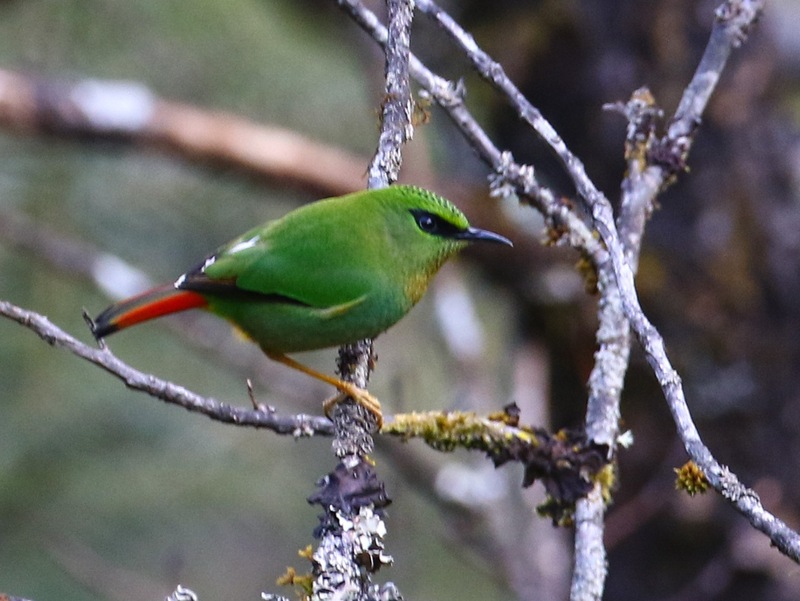 So, when Nick Bray, who led my birding trip in 2012, posted on Facebook that he was planning Zoothera Birding‘s first trip to Yunnan, I immediately signed up. 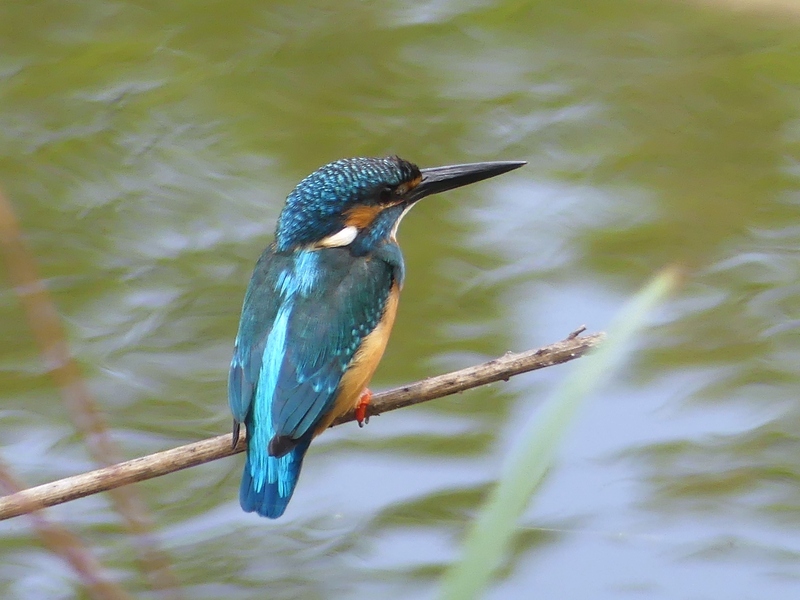 Common Kingfishers are widespread in Asia and I have seen them on every trip, this time in both Yunnan and later in Shenzhen. I arrived in Kunming in the wee hours of January 16th, a full day before the others so that I wouldn’t be starting the trip with jet lag. I planned to sleep late and then do a little birding on my first day. I thought that I was so smart when I was preparing for the trip and found a little park not far from the hotel. I printed the map so that I could show it to a taxi driver as no taxi drivers in China speak any English. The hotel called a taxi for me and, as planned, I showed my little map to the driver. I assumed that he would take me to the park, but after a few minutes he showed me his phone with a translation app. It said “That park is old and depressed. Why do you want to go there? 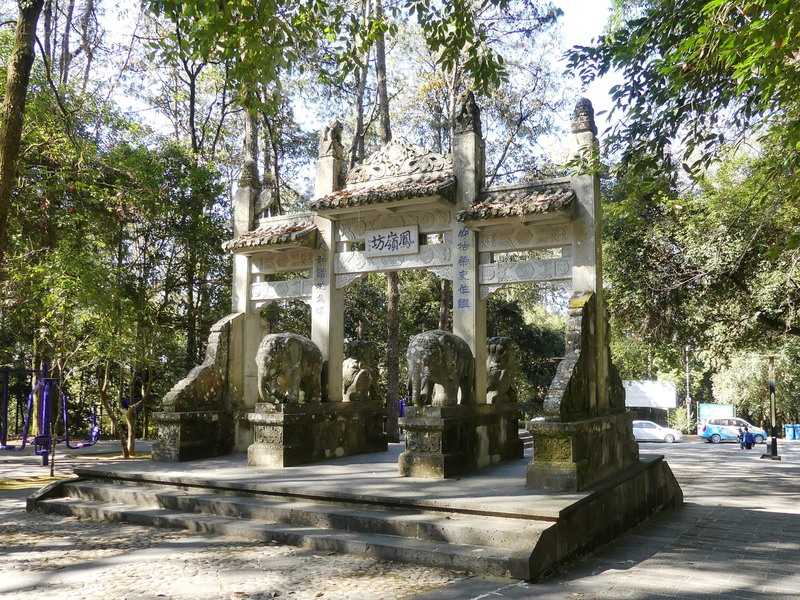 Guandu Forest Park is new and beautiful and it’s free.” I tried to ask how far the suggested park was, but the translation app turned “How far is the park?” into profanity. I vigorously shook my head “no” and gave up. So, of course, the driver took me to the suggested park, 45 minutes away and $15.00 rather than 10 minutes and the $3.00 fare that I expected. I was frustrated, but I should have known better. After four previous trips to China, I have learned that communication is difficult and misunderstandings are frequent, even when simply trying to get from Point A to Point B. The park was a typical Chinese city park – full of people, even a band playing – beautiful, but not conducive to productive birding. But, I quickly relaxed and enjoyed the lovely afternoon for a couple of hours. Even with all the activity, I found a little flock of Yellow-billed Grosbeaks, a species that the Zoothera group would not see at all. 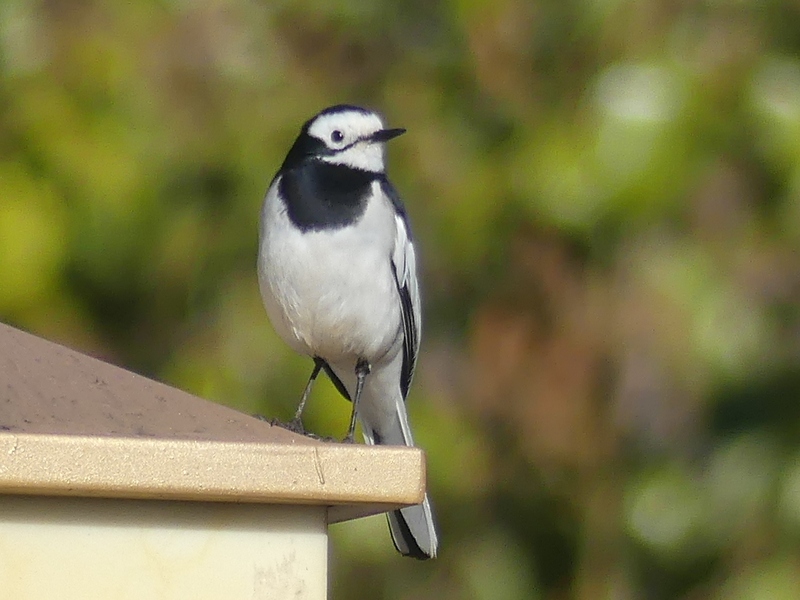 Back at the hotel, I found a few birds on the edge of the parking area, including several White Wagtails. I find Wagtails very interesting and always try to photograph them. This was the first time that I saw an alboides subspecies and I thought that he was a rather snazzy looking bird, even in winter plumage. That evening I enjoyed dinner with John Hopkins, another birder who had arrived early. The next day we met up with the rest of the group at the airport – ten participants and three guides. There was one other woman in the group, from Germany, and one man from Sweden. The rest of the group consisted of males from the UK except for our two Chinese guides. After a quick lunch, we were off on our adventure. Our first destination was Zixishan, a mountain park near Chuxiong, about three hours from Kunming. 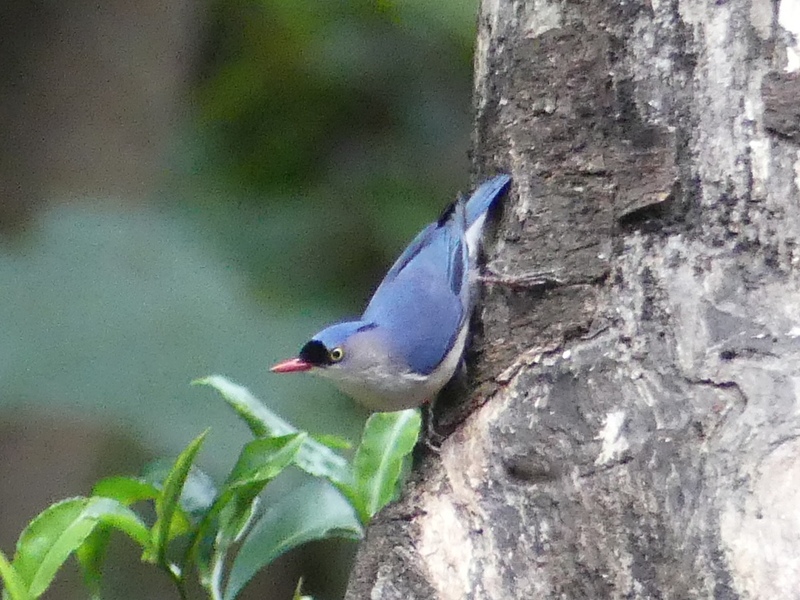 We arrived in time for a little birding before checking into our hotel and we found our two target birds right away – the endemic Yunnan Nuthatch and Giant Nuthatch. 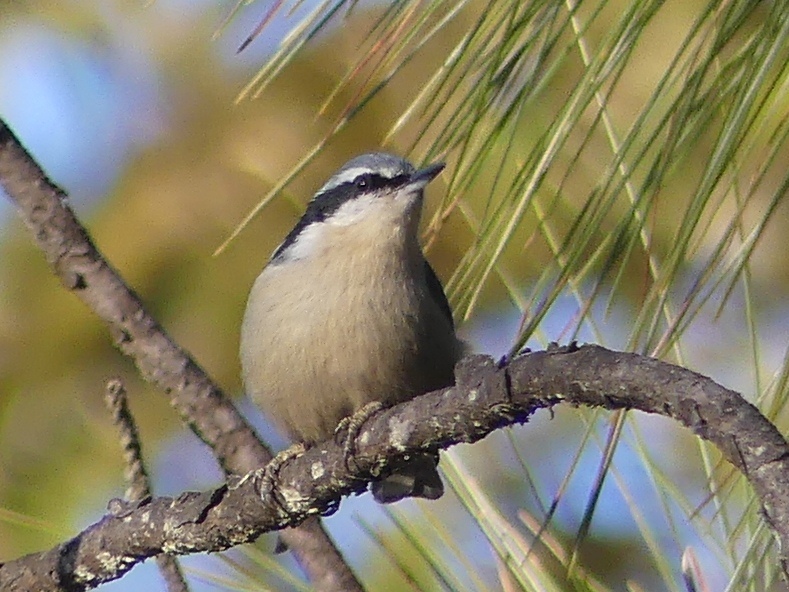 The Yunnan Nuthatch posed quite nicely for us at a close distance, not typical behavior we were told. The following day, we started birding at Zixishan before sunrise. It was a nice morning and we saw a good number of birds. 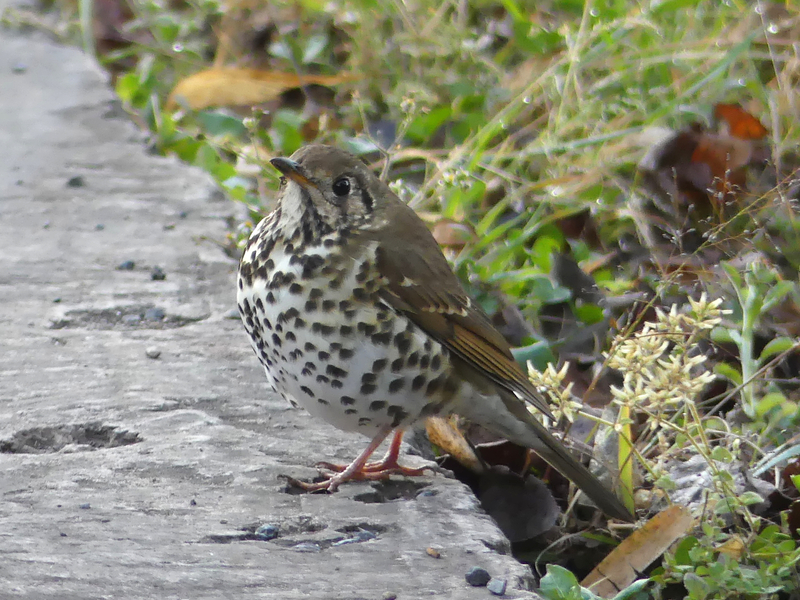 This Chinese Thrush sat on the side of the road and never moved, even as we moved closer and closer for photos. It was still sitting there when we left to look for other species. The afternoon brought a 6-hour drive to Lijiang where we hoped to see Biet’s Laughingthrush, my most wanted bird of the trip. But, alas, our good fortune at Zixishan did not continue at Lijiang. 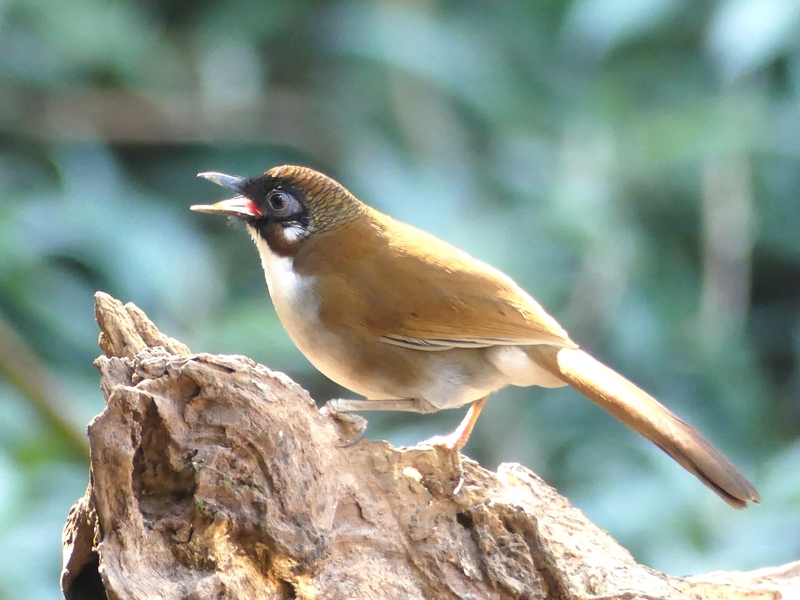 Despite several hours of intensive searching in the areas where the laughingthrush has historically been seen, we neither heard nor saw one. We learned that this rare bird is becoming increasingly difficult to find, perhaps in part due to illegal poaching for the caged bird trade. The best birds at Lijiang were a pair of Rufous-tailed Babblers bouncing around the top of a big trash pile, singing almost constantly. Several of us just sat in the grass a few yards away with our cameras and click-click-clicked as these normally shy birds put on a fantastic close-up show for us. The others in our group had started teasing me about ducks almost as soon as our trip started. Apparently I was the only waterfowl enthusiast, or maybe ducks were just too easy for the more serious birders with life lists of over 6,000 species. I got my wish to see ducks on the morning that we left Lijiang with a quick stop at Lijiang Wetland Park. I loved it! There were hundreds of birds on the lake. 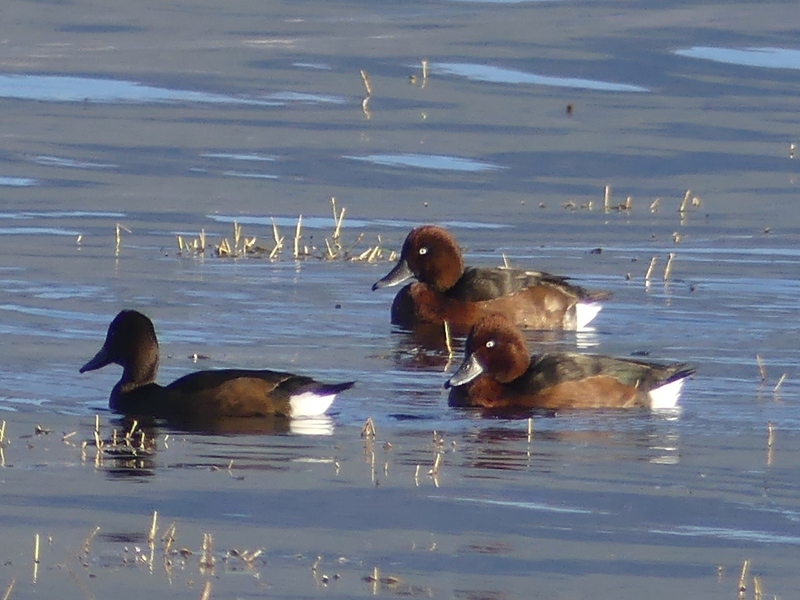 I got much better looks at beautiful Ferruginous Ducks than I’d had previously. And, I even got three life birds. Surprisingly, I had never seen a real wild Graylag Goose before. Red-crested Pochard and Smew were also new. It seemed that everyone enjoyed our short time at the wetland despite their earlier claims that they didn’t care about ducks. I think that we could have stayed for hours and everyone would have been happy. But, we had a long drive ahead, so we couldn’t savor the ducks and wetland birds for long. Back in the van, the more experienced birders gave me a good lesson in separating Black-headed and Brown-headed Gulls. With their expert knowledge and my photos, I quickly learned that it really was easy to differentiate these two species. 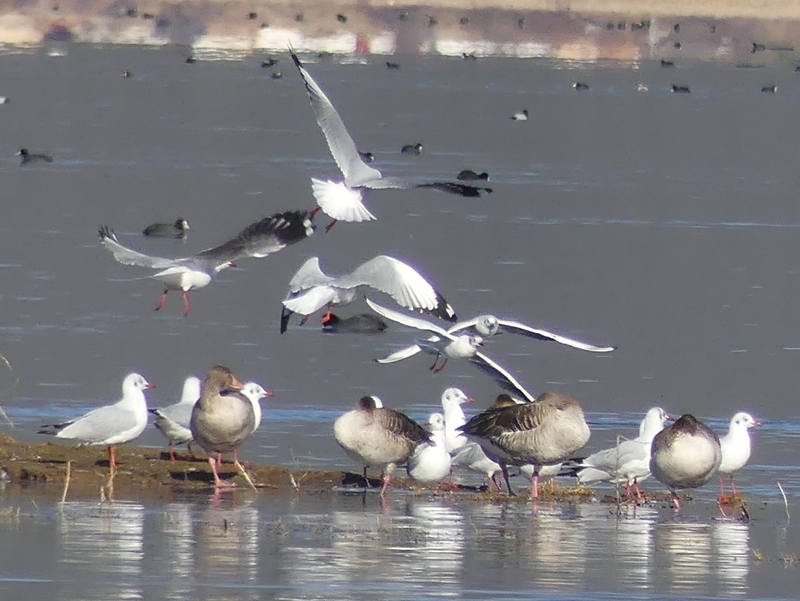 Brown-headed and Black-headed Gulls with Graylag Geese. Even in this rather poor photo, you can easily note the larger size of the Brown-headed Gulls, the dark wingtips, and huge mirrors in the outermost primaries. After leaving the Lijiang wetland, we drove 8 hours to Lushui. The next morning we continued through part of Gaoligongshan National Nature Reserve, over Pianma Pass (3,100 meters), and to the small town of Pianma near the Myanmar border where we would spend the next two nights. The first morning in this area started with one of the most thrilling sightings of the entire trip – and it was not a bird. 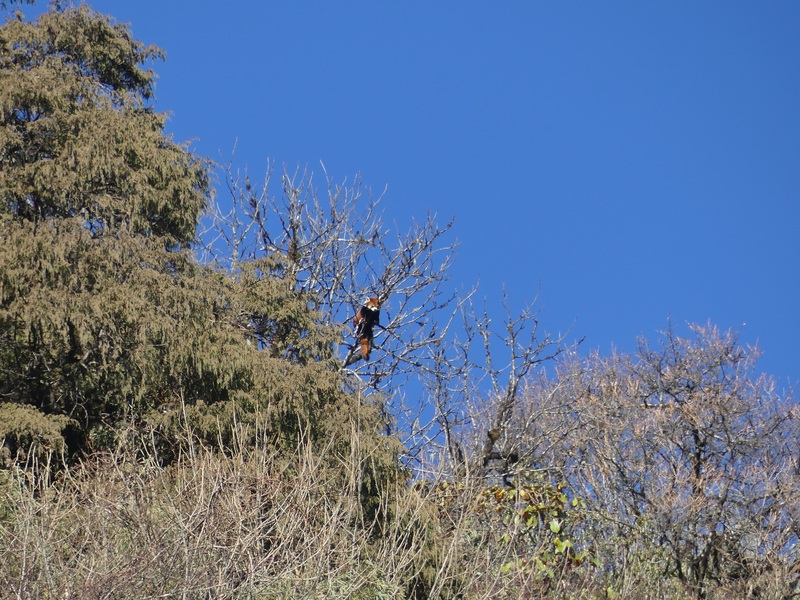 It was a Red Panda sleeping in the sunshine in a bare tree! This charismatic little mammal (about the size of a house cat) is fascinating. It has thick fur on the soles of its feet. It uses that fluffy 18-inch tail to wrap around itself for warmth. The Smithsonian has more interesting facts about the Red Panda, a species classified as endangered with a population of less than 10,000 remaining in the wild. 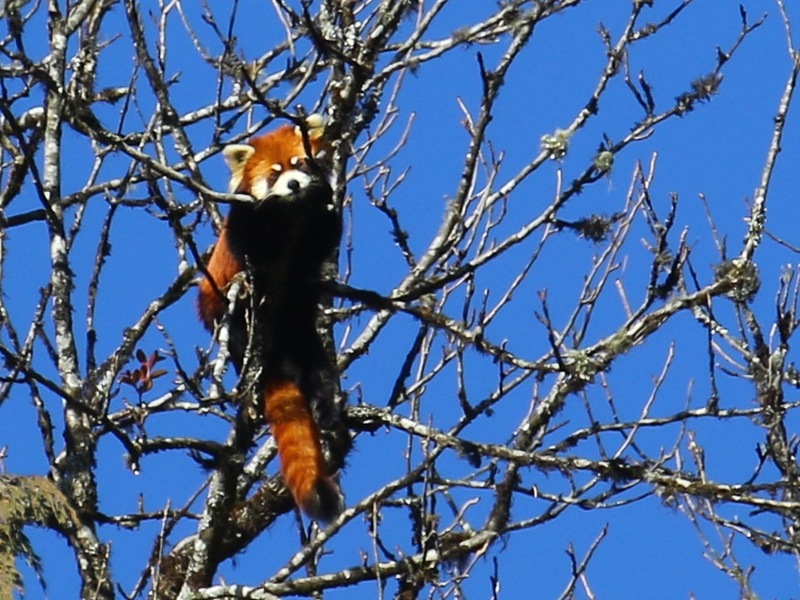 The Red Panda as seen from the road. A close-up of the adorable Red Panda. This is the view that we got through the scope. Photo by John Hopkins. After the panda sighting, things were pretty slow. Actually, they were very slow and this was my least favorite part of the trip. The hotel was awful, it was cold, and we didn’t find our main target birds. For two full days, we traveled back and forth over Pianma Pass and birded along the road, which was always covered in a thin layer of ice except in sunny spots. On the second day, several of the others found some good birds by climbing up the side of the mountain on rough rather steep trails. I stayed on the road not wanting to wear myself out or trigger an asthma attack by too much activity at 3,100 meters. OK, I was a little lazy. But, my vision is so bad that I don’t think that I would have seen the birds anyway, even if I had scrambled up the mountainside. Just like on my 2012 trip with Nick, most of the others were in better physical shape and were much more experienced and skillful birders than me. But I didn’t miss one of the best birds of the day when late that afternoon we found this spectacular little bird, a Fire-tailed Myzornis. 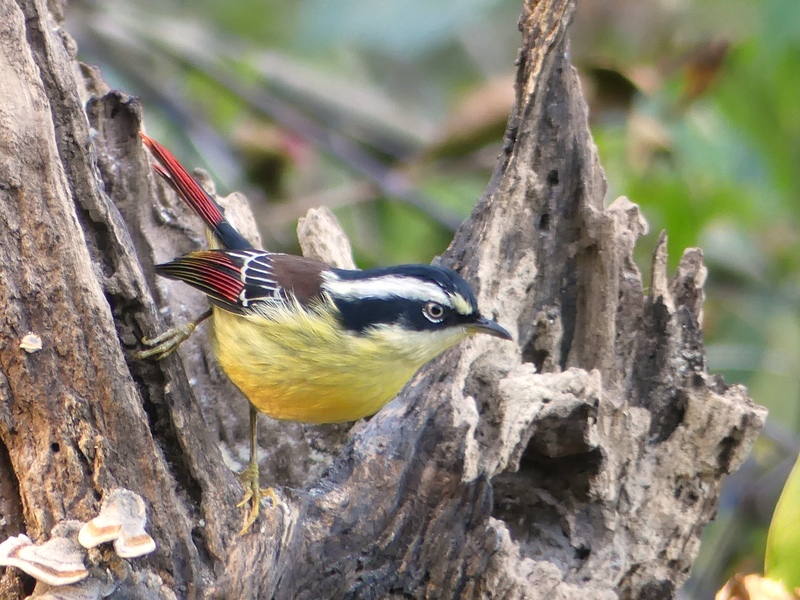 Fire-tailed Myzornis. Photo by John Hopkins. The following morning, we left for Baihualing and it’s many bird blinds, where I would be in birding heaven. Stay tuned. If you rode shotgun with me on my big trip, thank you! It was great to have your company and your comments encouraged me along the way. My longest road trip yet began on May 16 and ended on June 11, 2018. That was 27 days away from home and 7,114 miles driven in my wilderness green Subaru Outback. Montana and Nebraska were brand new states for me that I had never visited before. I had not been in Wyoming since a 1971 trip to Yellowstone National Park. 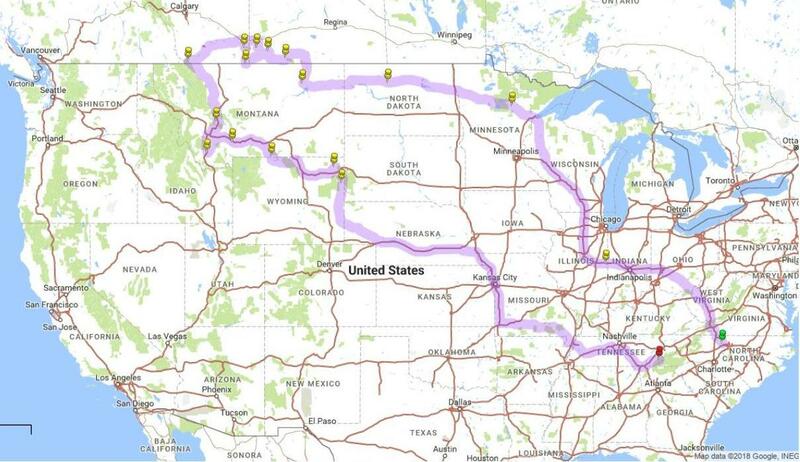 My approximate route for the trip. I continued on home from Tellico Plains, TN. 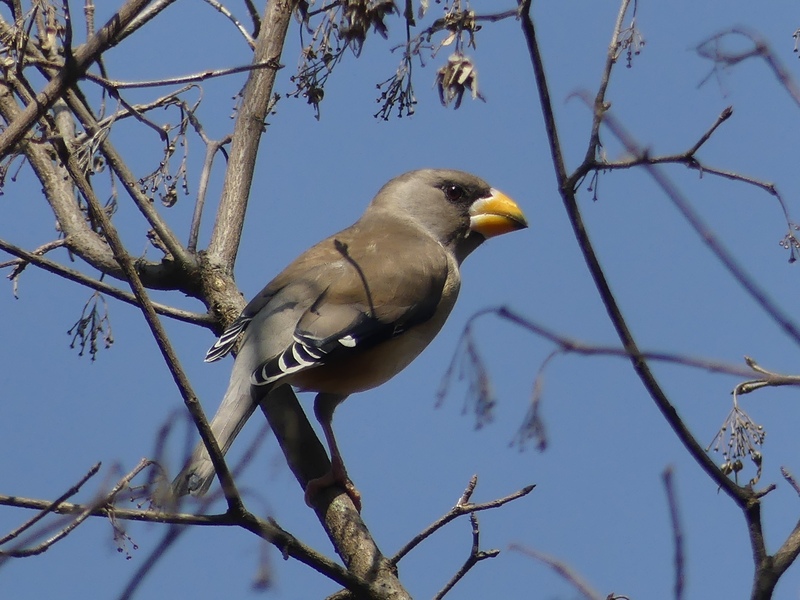 Birds provided the structure for the trip and I observed 171 avian species, including a few in the North Carolina mountains during the Cherohala Challenge part of the trip. The life birds that I hoped to find were all challenging; I got eleven of my 20 targets. 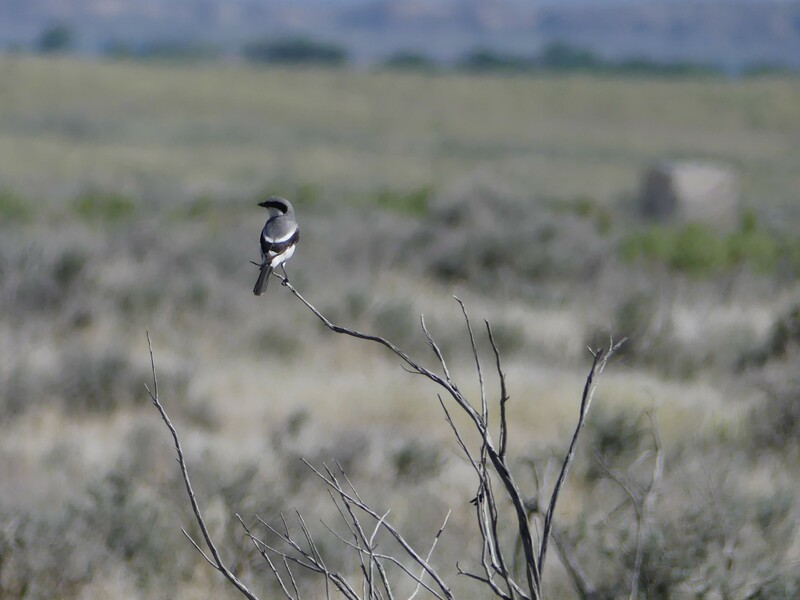 Birds that I was thrilled to find by myself were Mountain Plover, Greater Sage-Grouse, Baird’s Sparrow, McCown’s Longspur, and Gray Flycatcher. All of those are prairie birds and I found that I enjoyed birding in that habitat best. 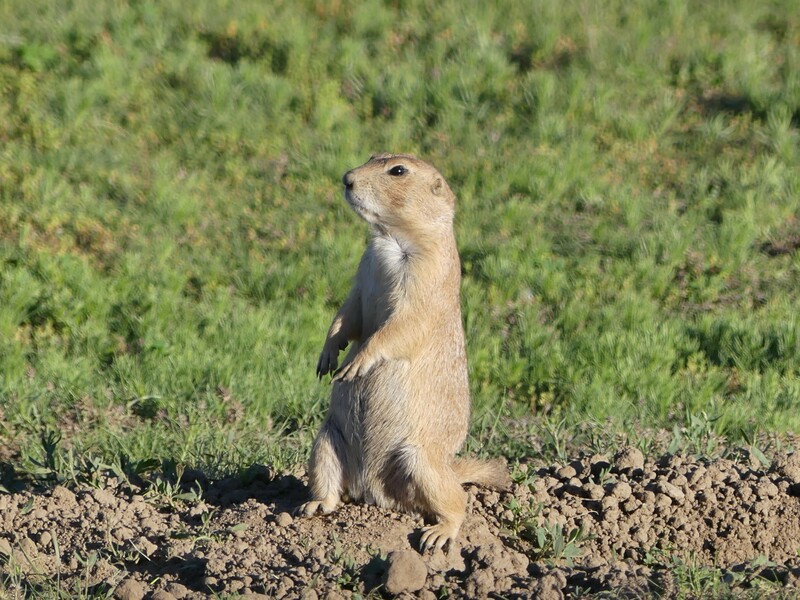 I would have liked to see more mammals, but I did enjoy the Pronghorn, Richardson’s Ground Squirrels, Prairie Dogs, and especially an adorable little Thirteen-lined Ground Squirrel. Snakes and lizards would have been interesting, too, but I saw none. 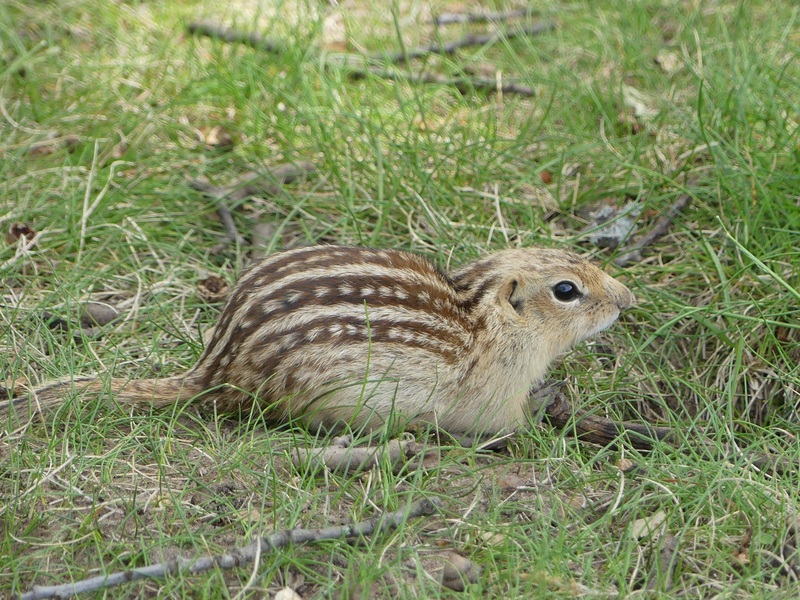 A Thirteen-lined Ground Squirrel at a rest stop in Wisconsin. 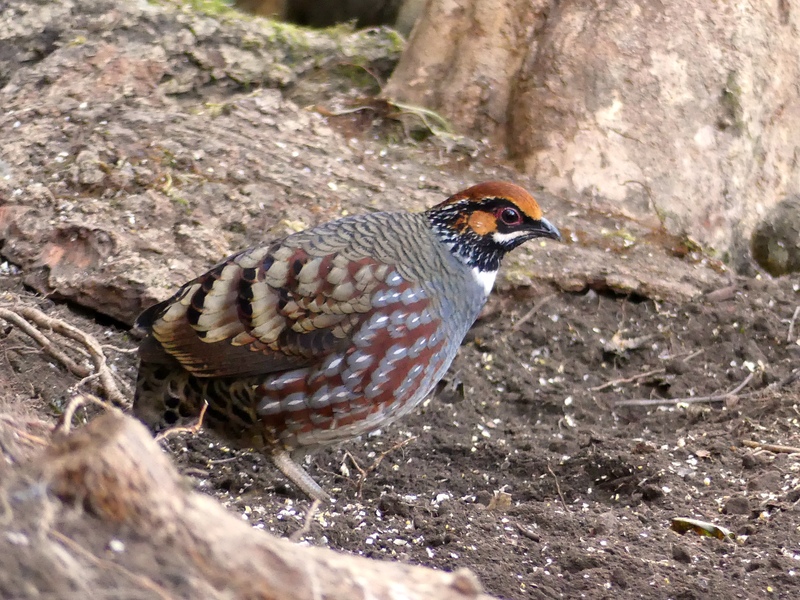 Other life birds found with a little help were Gray Partridge, Williamson’s and Red-naped Sapsuckers, Flammulated Owl, Northern Pygmy-Owl, and Sage Thrasher. 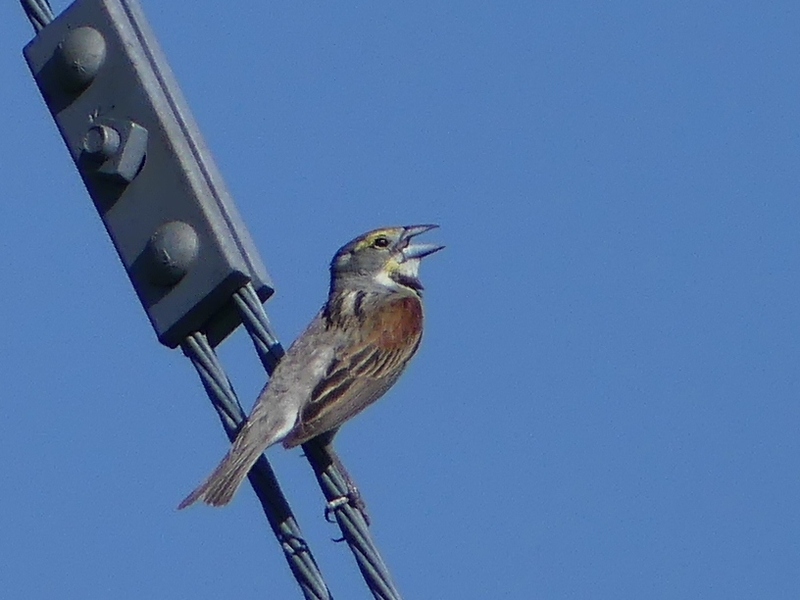 I can’t pick a favorite bird of those, but my favorite moment was standing all alone on the prairie in Grasslands National Park watching my life Baird’s Sparrow and listening to him sing. The moment probably lasted close to an hour and I tried to just soak in the beauty of the time and place and take a few photos. I missed other birds for various reasons. 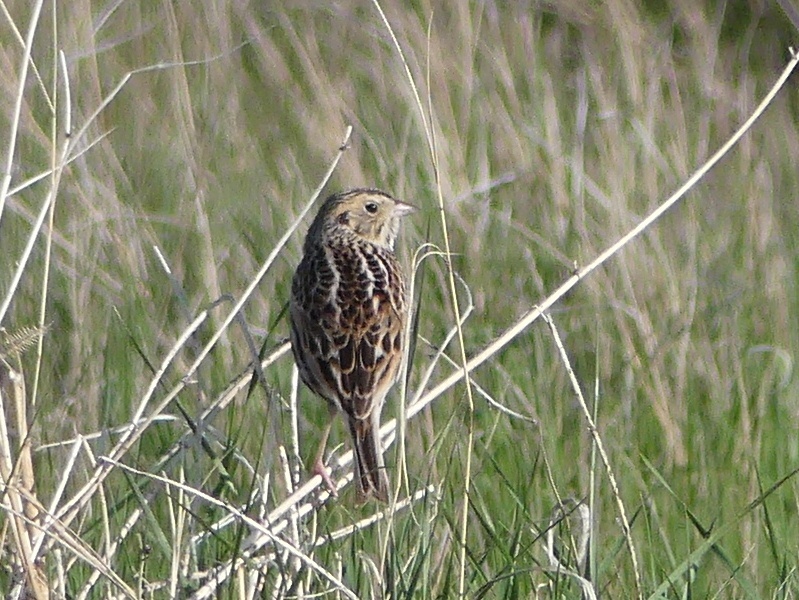 My poor vision and hearing are most likely what cost me Sprague’s Pipit. I even stood next to someone one day who said that she was hearing them in the distance. When I arrived at Waterton Park and learned that many of the trails and roads were closed due to last year’s fires, I knew that I was unlikely to find Spruce Grouse as that was the only location in my itinerary where there was any chance for it. 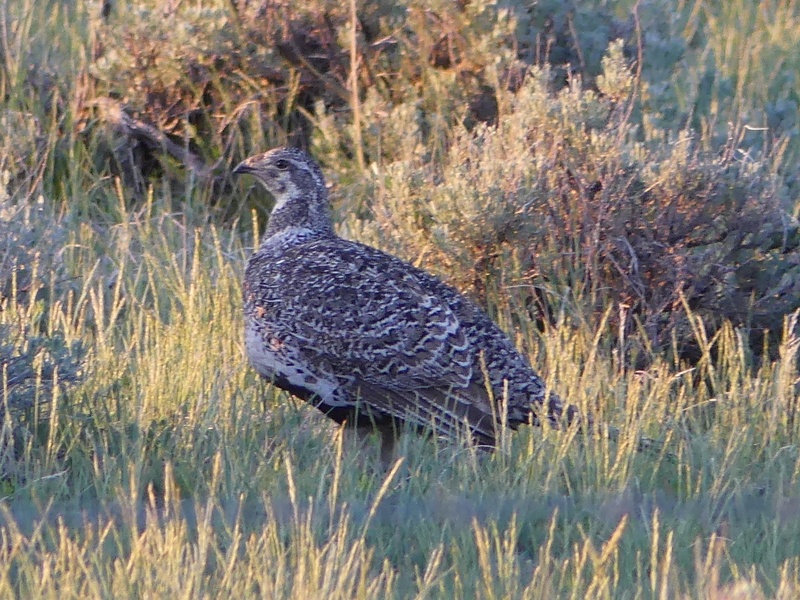 It was also the best location for Dusky Grouse, so I missed it, too. I’m not totally certain why I could not find a Prairie Falcon. Before the trip, several folks had said that they expected I would find one, but perhaps it was a little too late in the season as the birds were nesting. Once in Montana, people said that it would have been easier earlier in the year. 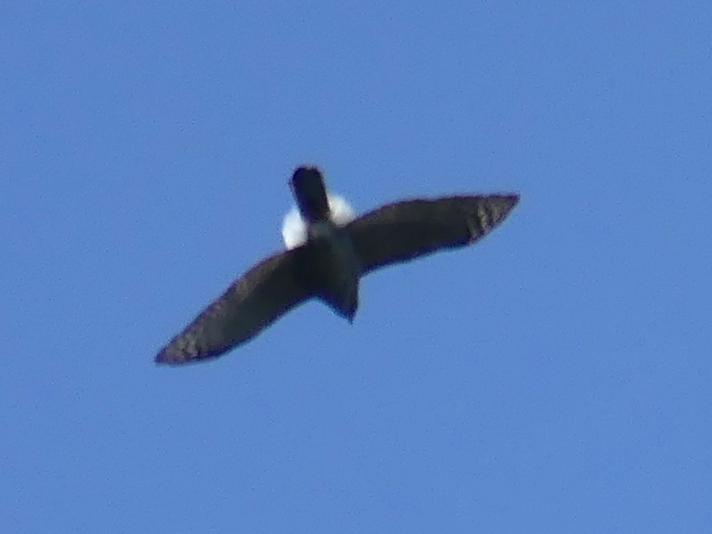 Northern Goshawk is always a difficult bird to find, so it’s no surprise that I missed it. With a little more time, I probably could have found Cordilleran Flycatcher, especially if I’d had another day in Helena with Stephen’s help. He and Bob had seen them earlier in the day that I arrived. But, we spent our time focusing on the woodpeckers and owls, birds that are more fun and we had wonderful success with those. 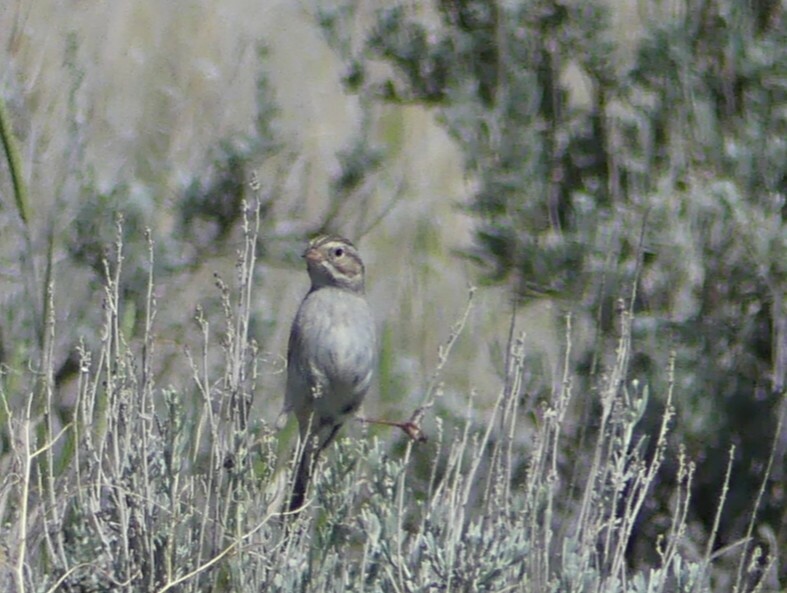 I lost half my chances to look for Sagebrush Sparrow when I got rained out on Bannack Bench Road in Montana. I tried to find it on Bear Canyon Road, but had no luck there. Black Rosy-Finch was missed because I wimped out on driving the steepest part of the Beartooth Highway. Next time! And, lastly, Virginia’s Warbler just did not want to be seen in Roby Canyon in South Dakota. Even the top local birders had no luck the day that I was there. My late husband used to say “Always leave something for next time” and I certainly did just that. 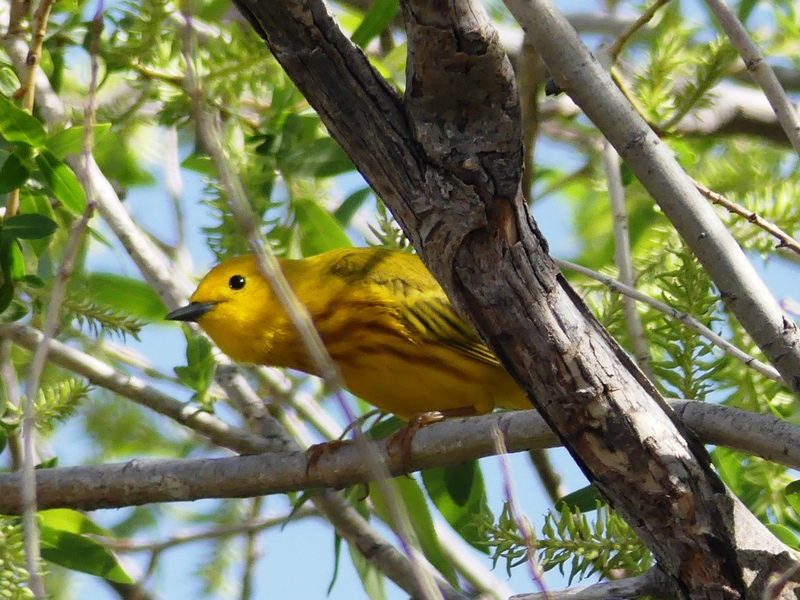 A Yellow Warbler peeks around the tree to watch me. One of my favorite photos! Photographing birds can be challenging due to poor light, the birds being too far away, and various other difficulties, but I did my best. I posted 155 photos to my eBird lists, some only good enough for identification and some that make me very happy. Sometimes it was the simple shots of common species that made me smile. All that driving turned out to be relatively easy, especially since I planned my route to miss major cities. Getting over 400 miles on a tank of gas helped, so most of my stops on big travel days were at rest areas. I took food from home for lunch and dinner and replenished perishables at grocery stores a couple of times. I started each day with two canteens full of fresh cold water, so I had everything that I needed in my car. These strategies enabled me to drive 1,300 miles in the first two days, to Grand Rapids, Minnesota, northwest of Duluth. From there, I had no more especially long days until heading back home at the end of the trip. 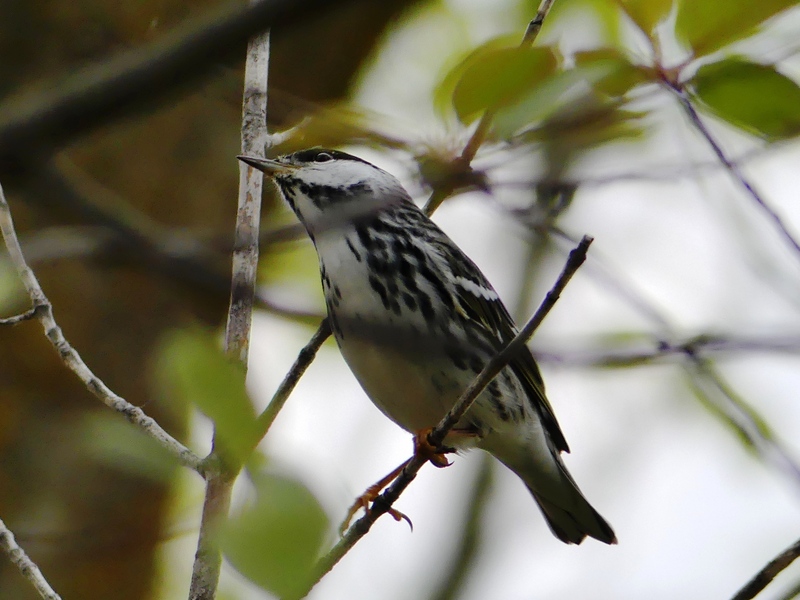 A nice rest stop bird, a male Blackpoll Warbler. They were so much easier to see in Minnesota than at home! There is little traffic on many of the western roads and what you have heard about high speed limits is true. I drove many two-lane roads with speed limits of 70 MPH. Most of those roads had a feature to facilitate safety – rumble strips on the center line. A lot of the roads in Canada were gravel and relatively wide, which made it easy to stop for birds. 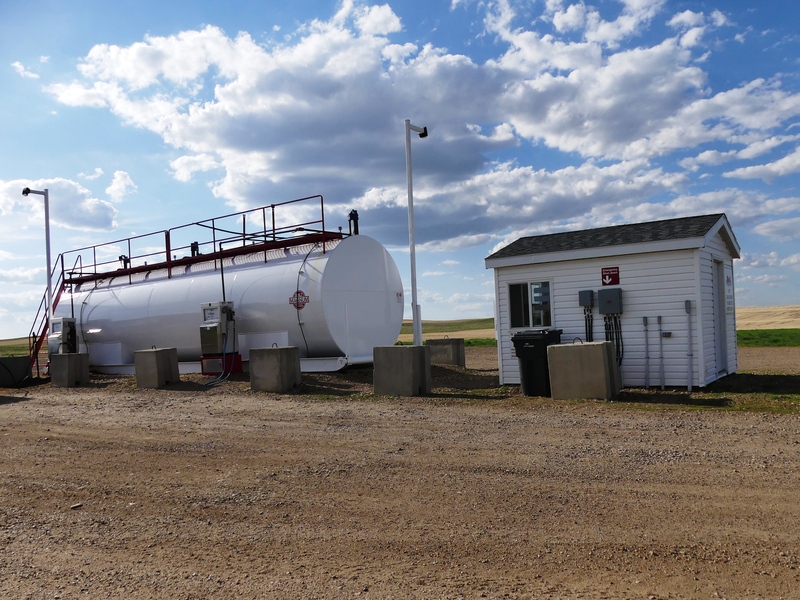 In parts of Saskatchewan there were only Card Lock fueling stations rather than typical gas stations. Their purpose is mainly to serve commercial vehicles and some only have diesel fuel, but the ones that I encountered also had regular gasoline. They are always unattended and always open. You go into the little house, insert your credit card and specify a dollar amount greater than what you will use. After approval, you go out and pump your gas. And, then you go back into the little house and insert your credit card again to get a receipt. And, don’t forget to shut the door behind yourself (the sign reminds you). My trip took me through much of the current Greater Sage-Grouse range. Historically, Sage-Grouse occurred in at least 16 states within the western U.S. and three provinces in Canada. Experts estimate that the population was as high as 16 million before European settlement; today there are only a few hundred thousand. The decline has continued relentlessly, by 60% in just the last five decades. Sage-Grouse are now extirpated from British Columbia and five U.S. states. In 2015, a fierce political battle about listing under the Endangered Species Act (ESA) resulted in the decision to not list the grouse. They face many threats, the most serious being habitat loss. But even without ESA listing, serious efforts are underway to protect the species. As a casual observer driving through Montana, none of this was obvious to me. It looks like immense areas of sagebrush remain almost pristine, but that was an illusion. 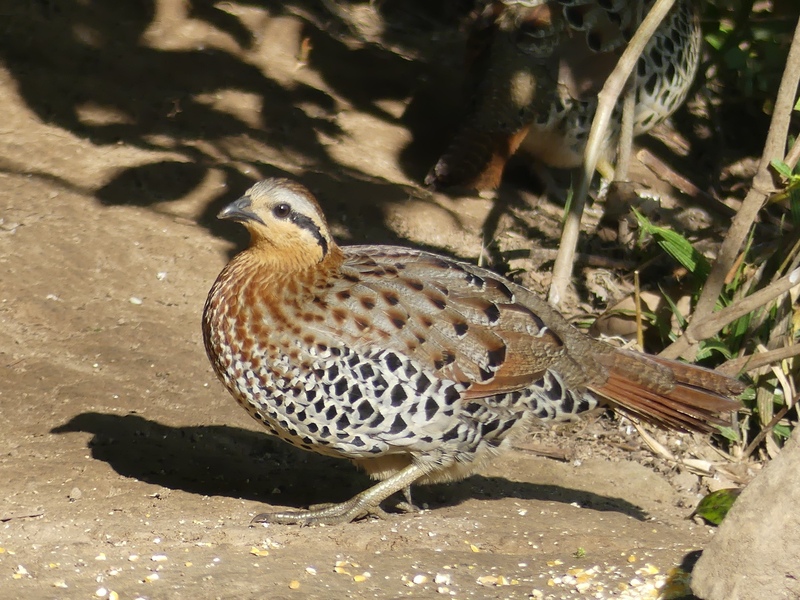 The recovery efforts are addressing various threats to the grouse. The one that I heard about from a local rancher is fence line flagging – clipping small reflective markers along the top row of barbed wire fences every three to four feet. The markers help the low-flying grouse see the wires and avoid collisions which result in injury or death. He told me about his conversations with a biologist studying the birds and said that he readily agreed to have the fence on his land flagged. 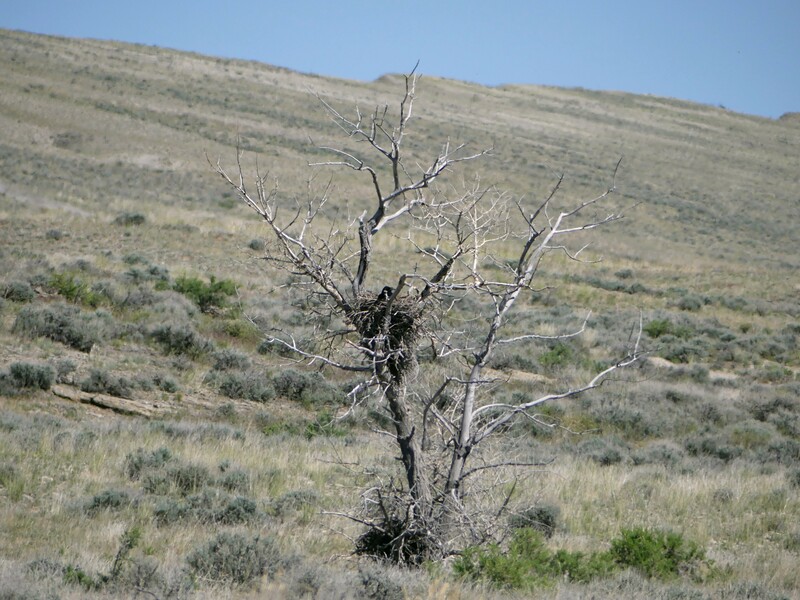 In Canada, the total population of Sage-Grouse declined by 98% between 1988 and 2012. 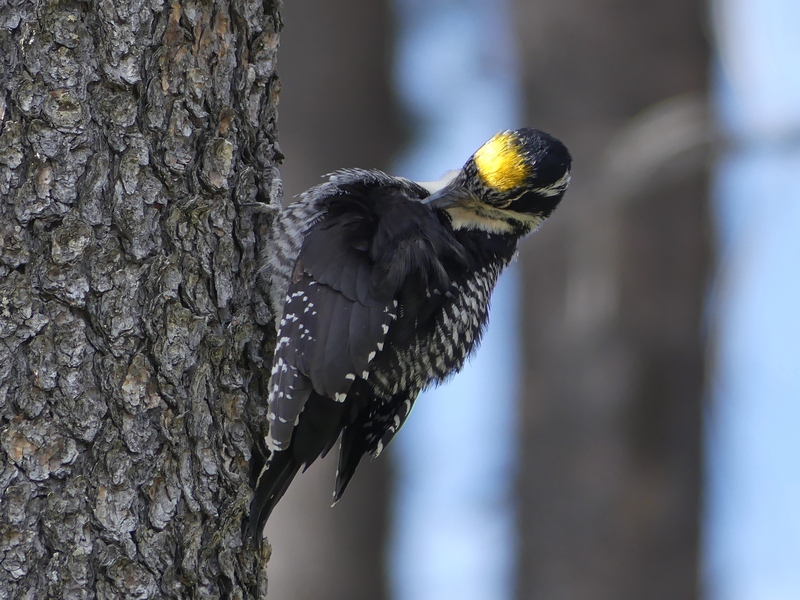 A total of only 93 to 138 adult birds were estimated for Alberta and Saskatchewan combined in 2012. The species has been listed as Endangered in Canada since 1998. Nature Canada has a nice summary of the species status and recovery efforts. See the Cornell All About Birds site for more basic information on the fascinating Greater Sage-Grouse. 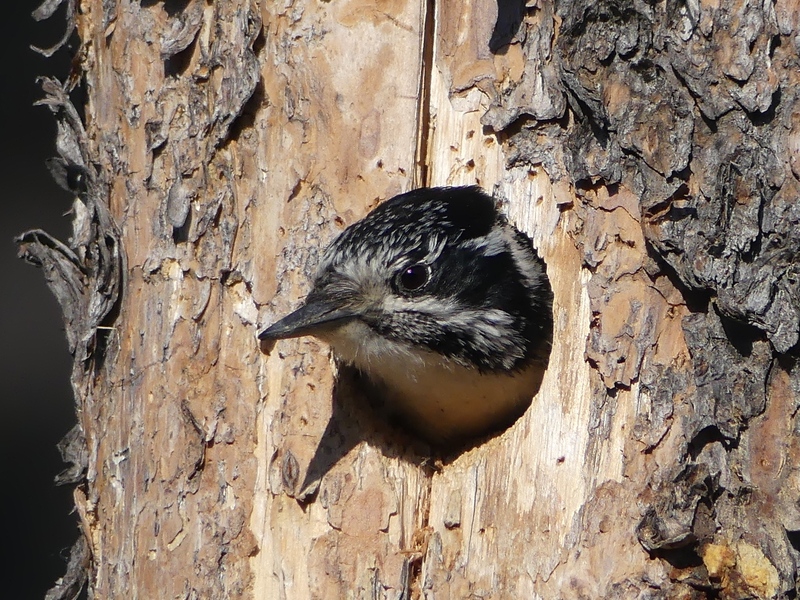 One of my favorite experiences on the trip was finding an American Three-toed Woodpecker nest at Cypress Hills. Papa Three-toed flew to a nearby tree to preen after leaving the nest cavity. Did I get lonely on the road traveling alone for so many days? No, not at all. Actually, I met some wonderful people and feel like I made a few new friends. First, was Allison Henderson. Allison and her family were packing their car after camping at Two Trees in Grasslands National Park just as I arrived. In an amazing coincidence, I was looking for Baird’s Sparrow and McCown’s Longspur and Allison is a wildlife biologist who studied grassland songbirds for her PhD. She gave me a few tips and we stayed in touch with phone calls and text messages. Thanks for the alert on the Long-billed Curlew, Allison! Next was PJ Chudleigh at Cypress Hills Interprovincial Park. PJ is in charge of maintenance at The Resort at Cypress Hills (where I stayed) and is passionate about the natural habitat. PJ and a buddy saw me birdwatching when they were riding their bikes. I always feel dorky when I’ve got my binoculars and am out looking for birds when “normal” people are doing other things. But, they thought it was cool that someone was paying attention to the wildlife. We felt an instant connection and could have talked for hours. And, then there was the rancher I met on Bannack Bench Road, the nice couple walking by the lake at Waterton National Park, and many others. Some conversations were short, but when I told someone what I was doing, I always got “Good for you!” in response. 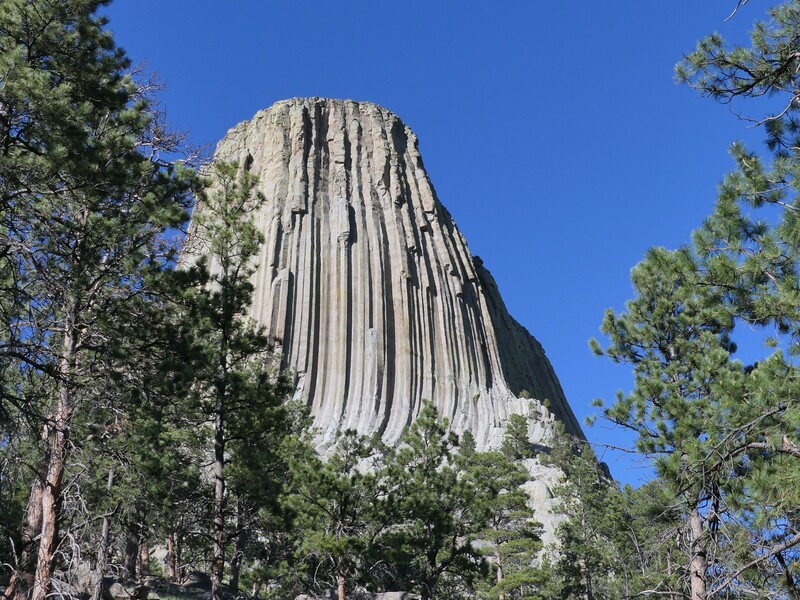 I was impressed with the beauty of Devils Tower in Wyoming – 867 feet from its base to its 1-1/2 acre summit. In addition to these surprise encounters, I enjoyed spending some time with the birders whom I had contacted before the trip, Stephen Turner (and his wife, Patty) in Helena and Ron Farmer in Bozeman. I loved meeting new people, seeing new parts of the country, and finding my own way through it all. My goals to see a few new birds and new landscapes were accomplished. But, more than that, I gained confidence in myself and I feel stronger than ever. I might not be ready to backpack through Europe alone yet, but I’m ready for another road trip! More photos can be seen in my Flickr album for this trip, Prairie Road Trip 2018. As of June, it’s not complete, but I will add more photos and label them all correctly soon. Driving through Nebraska was monotonous compared to the more western states. The view from the highways was nothing but agricultural fields for mile after mile. I did not even see birds from the road as I had in other areas. However, beautiful rest areas along the Platte River were like little oases in this hot and dry land. They had lovely trees, birds, and each one came with a history lesson about the Oregon Trail. Here are a couple of photos taken at O’Fallon’s Bluff rest area on Interstate 80. Late in the afternoon, I also made an unplanned stop at the Audubon Center at Rowe Sanctuary in Buffalo. 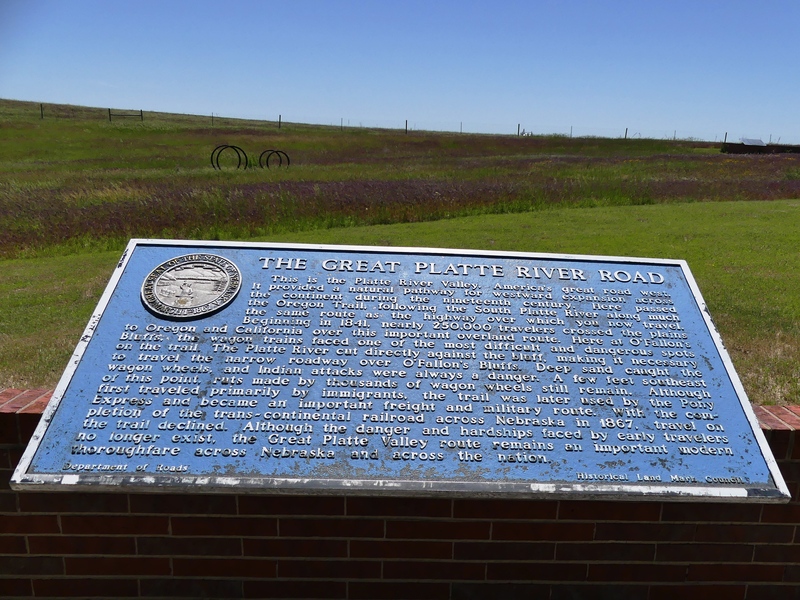 The center is most well-known for Sandhill Crane viewing on the Platte River in the spring. It is a lovely spot along the river and even on a hot June afternoon, I easily found birds. It was fun to see Dickcissels where they are common. These guys seem to sing all day! 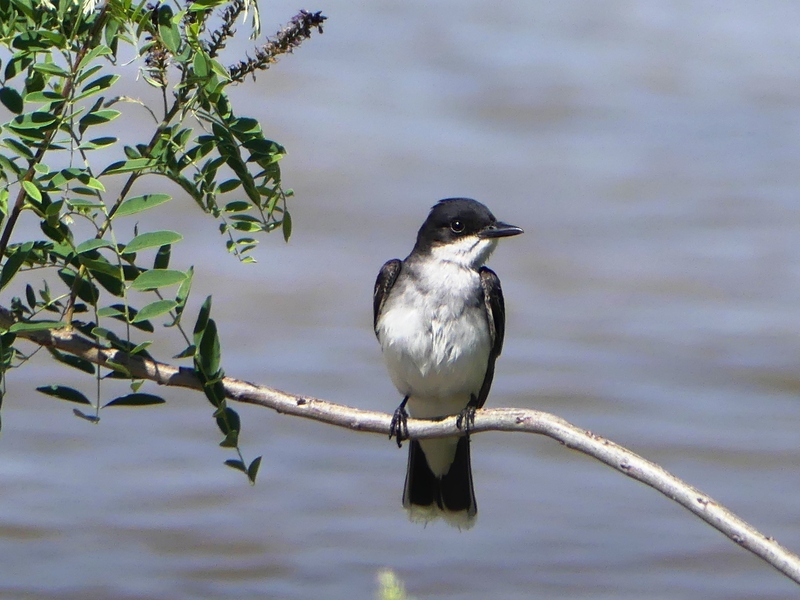 An Eastern Kingbird enjoys its perch over the Platte River. On Wednesday, it was on to the next state – Missouri. Again, it took most of a day to drive through one state. But, I did start the morning at Loess Bluffs NWR, which I suspect may be one of the best wildlife refuges in the country. I was pleased with the 32 species that I found in two hours without getting out of the car. But when I checked eBird, I saw that the previous day two guys had recorded 97 species! Loess Bluffs is definitely on my list of places to go again. 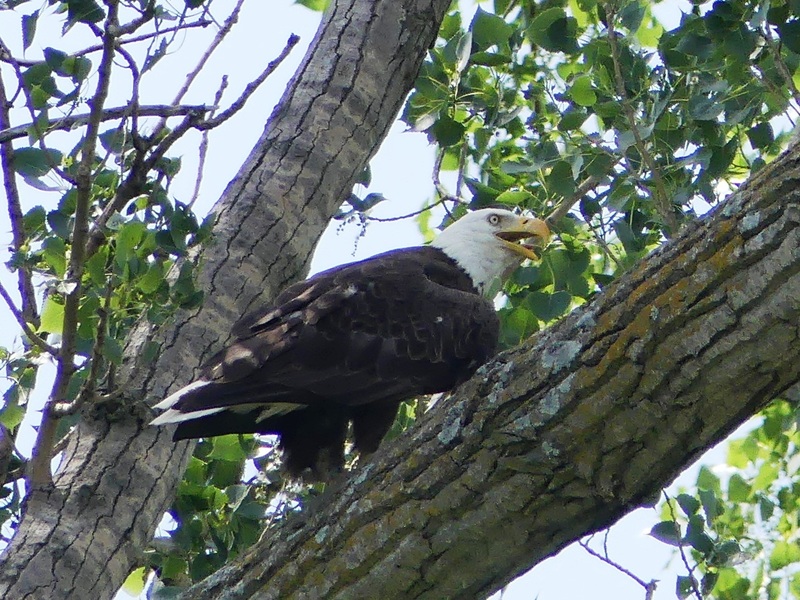 An adult Bald Eagle at Loess Bluffs NWR in Missouri. My third and last big travel day towards home was mostly through Tennessee. It was one of the few days that I did not do any birding at all. 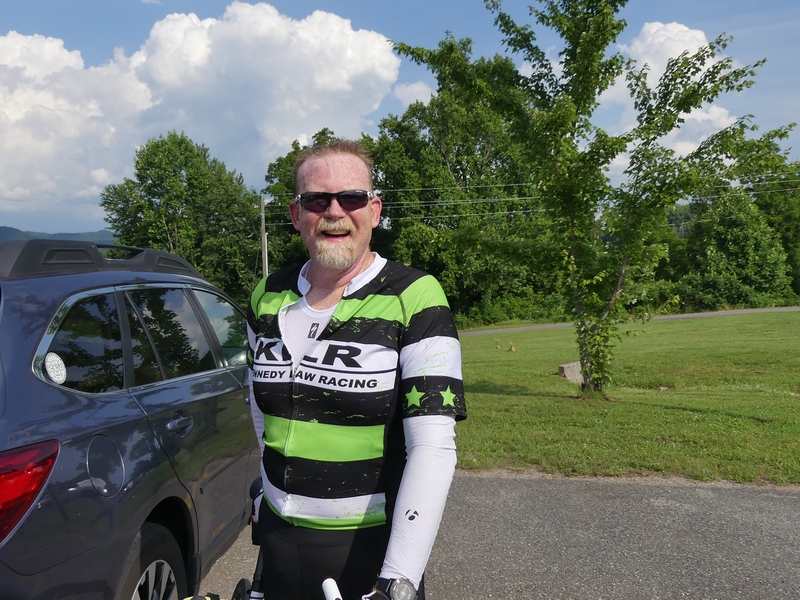 I needed to be in Tellico Plains on Thursday night to help my friend, David, with his adventure – The Cherohala Challenge, a road bike event. David successfully completed the 62-mile ride last year. This year he would be participating in the longest ride, 115 miles up the Cherohala Skyway, through The Tail of The Dragon, an 11-mile stretch of US-129 with 318 curves, and then back to Tellico Plains. 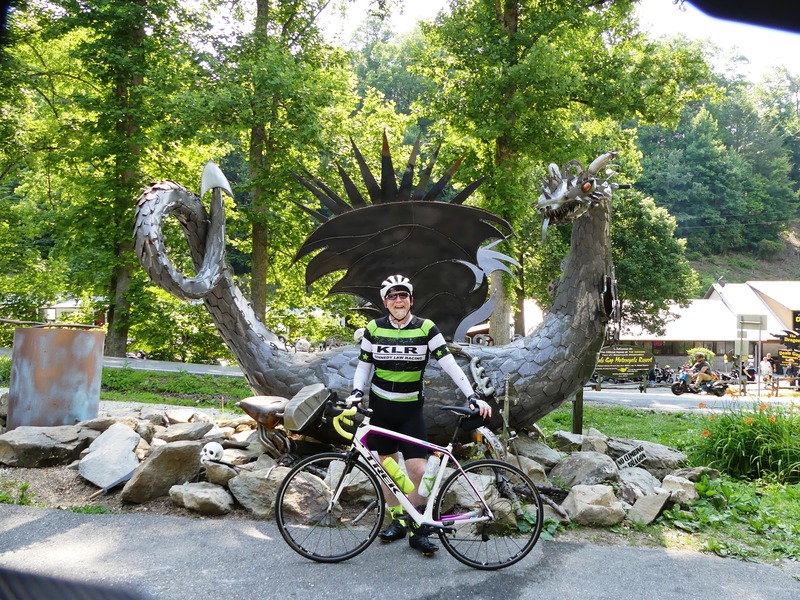 David stopping to pose with the dragon during the ride on Saturday. On Friday, we drove the route in the car and I marked every stop in my GPS. We had a very nice time and finished with a few hours to spare, so we went in search of Tennessee birds for my list obsession. I randomly choose an eBird hotspot not too far away. At first it appeared to be a dead-end road with a path to the river at the end. We walked the path and were lucky to see both White-eyed and Red-eyed Vireos as well as an Orchard Oriole. 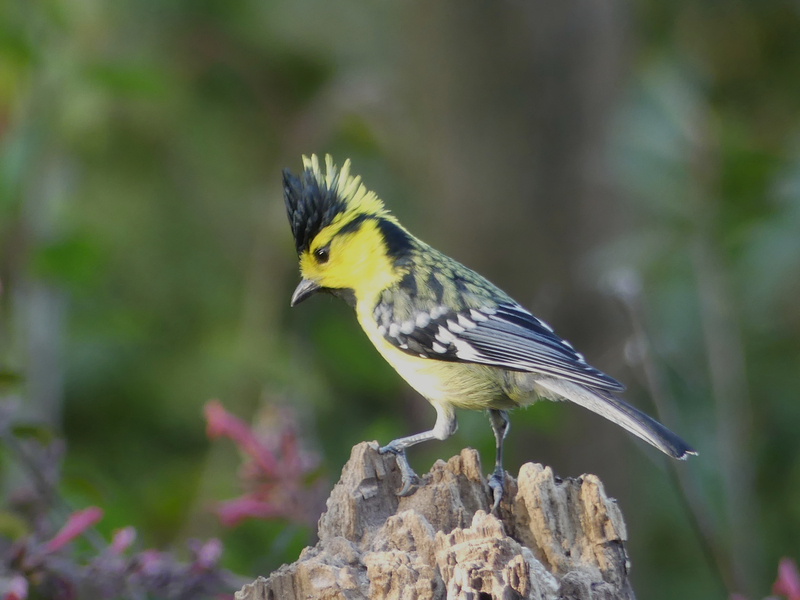 Those birds helped me reach one of my goals – over 50 species for Tennessee. The path led to Chota Memorial, a full scale representation of the townhouse, or council house, originally erected by the Eastern Band of the Cherokee Indians, a completely unexpected and interesting surprise. 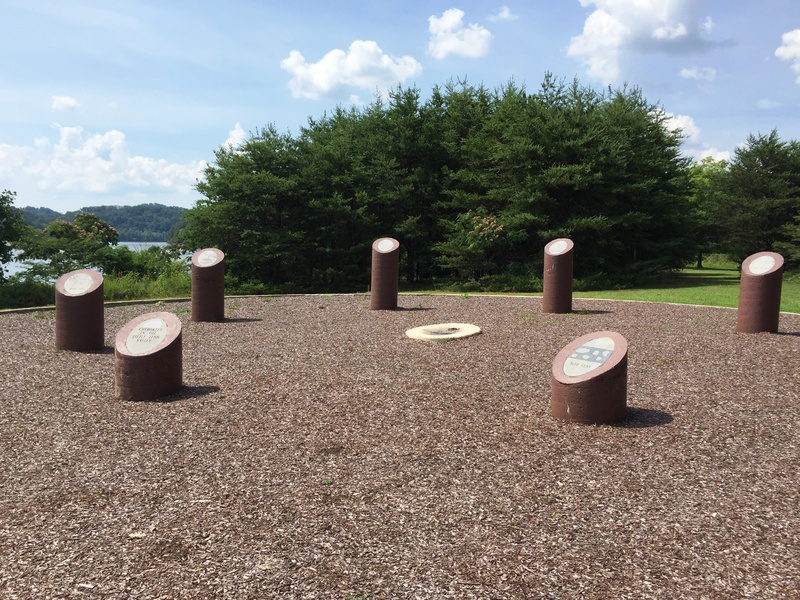 Chota Memorial lies along Little Tellico River. We were up at 5:00 AM on Saturday, the day of the big ride. I dropped David off at the starting line and headed to the first rest stop to wait. The volunteer was just setting up and gratefully accepted my offer to help. I made peanut butter and jelly sandwiches, cut up fruit, and put out other goodies for the riders for an hour. Then, it was off to the next stop to wait for David. For over 10 hours, he rode and I did what I could to help my friend and others with food, water, and encouragement. Coming into a rest stop on the Cherohala Skyway. 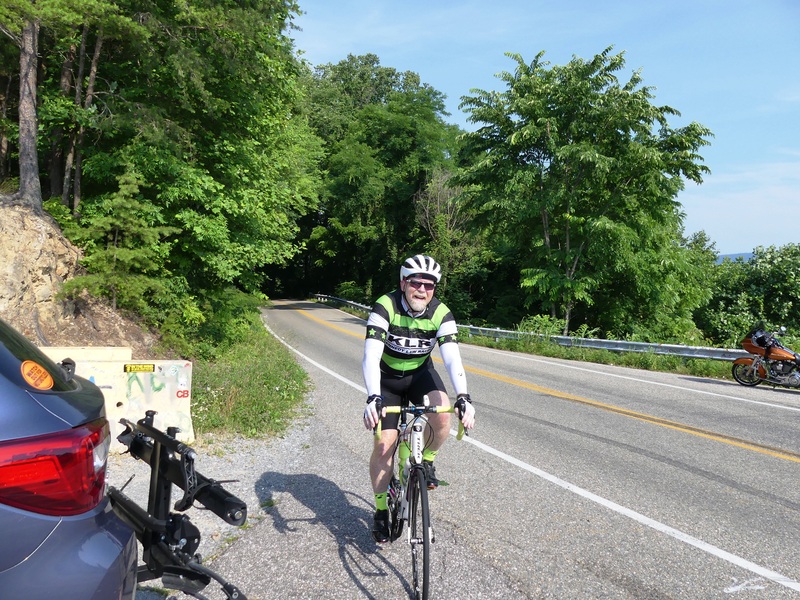 At the toughest part of the ride – 8 miles at a very steep grade to the highest point – I even gave one guy a ride because he was cramping too badly to ride that stretch of road. Fortunately, David’s hard work training paid off and he got to the top under his own power. After another 31 miles, he reached the finish line – tired, but extremely happy. David was happy and smiling after riding 115 miles! Sunday was a recovery day, so we did a little birding in the NC mountains. We were able to add a few birds to my county lists and see more beautiful scenery. After all my traveling this past month, I still love North Carolina. I drove home yesterday, June 11, and that’s the end of the trail. Stay tuned for a few numbers (miles driven, species observed, etc.) and reflections on the adventure in a few days. On Sunday morning, I headed back to Bear Canyon Road to look for Sagebrush Sparrow again. Remember, I was looking for these birds instead of Black Rosy-Finches because I was scared to drive the Beartooth Highway. I got to the road several hours earlier than the previous day, but I found even fewer species and did not find my target bird. After two hours of serious searching along the two-mile stretch of road, I set my GPS for Tellico Plains and started driving. I was soon in Wyoming and enjoying the beautiful landscape, even prettier than Montana if possible. The distant mountains were gorgeous and before I knew it, I was driving up into those mountains. The road became narrow and steep with sharp drop-offs and hairpin turns. A sign at a scenic overlook told me that I was in Bighorn National Forest. Another sign a short time later stated that the elevation was 9430 feet. I talked with a guy who had ridden his motorcycle up and he told me that the Beartooth was “a piece of cake” compared to what I had just driven. I’m not sure that’s true, but I did drive one of Wyoming’s scenic mountain roads that had not even opened for traffic until May 20. I had been somewhat uncomfortable driving WY 14A, but not terrified. There was no time to anticipate the road ahead and I had no choice but to keep driving. After I finally got out of the mountains, I drove to Devils Tower. I was stunned that a piece of rock could be so captivating. The entire park around the landmark is absolutely gorgeous and easily worth a full or half day to hike the trails. 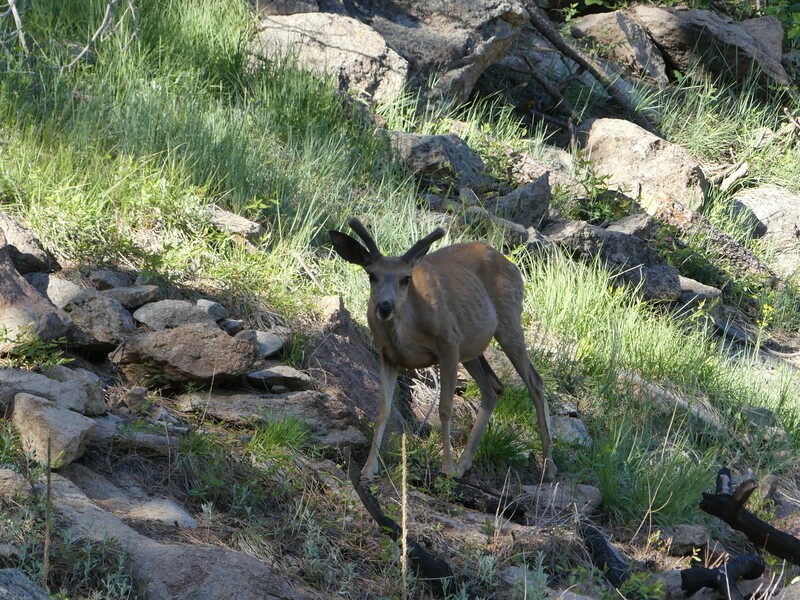 I walked a short way on one trail and saw this young guy. Update: The prairie dogs at Devils Tower are the same species that I saw at Grasslands National Park, Black-tailed prairie dogs. Yesterday, I started the day by crossing the state line just into South Dakota to look for Virginia’s Warbler in Roby Canyon. It’s an isolated location where you don’t expect to run into anyone else, but I met two other birders. Together, we searched for a couple of hours without seeing our target bird. I was disappointed, but at least I could blame the miss on luck rather than lack of birding skill when two top local birders could not find it either. 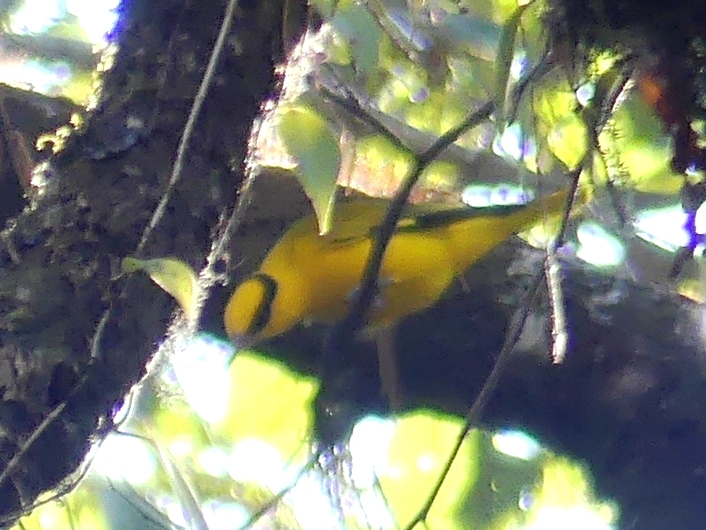 They described the Virginia’s as one of the warblers that just does not want to be seen. Here is a pretty female Mountain Bluebird that I did see on the way to Roby Canyon. I spent most of the afternoon driving through Wyoming and crossed into Nebraska just before I stopped for the night. 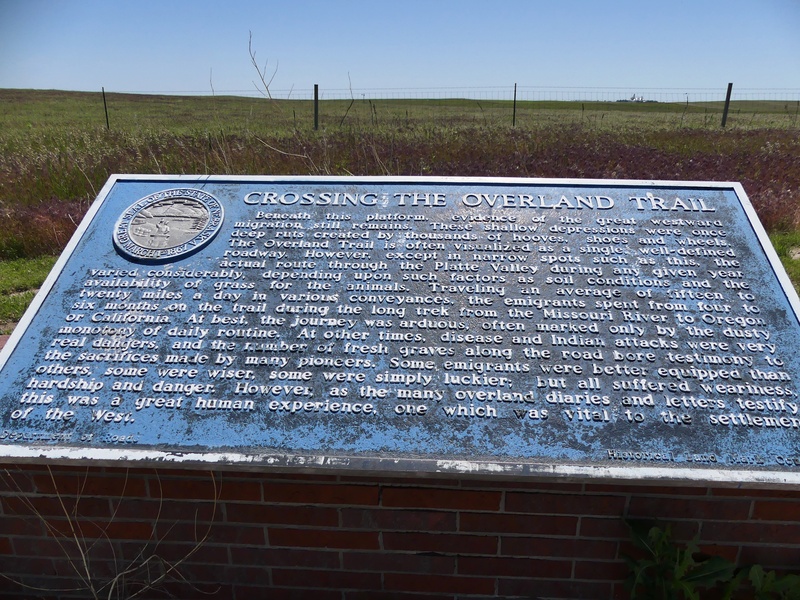 Before I left home, I had read about half of “The Oregon Trail” by Rinker Buck, a modern-day adventure with lots of history. As a child, I was fascinated with the story of pioneers who moved west and now I am seeing the country through which they traveled. 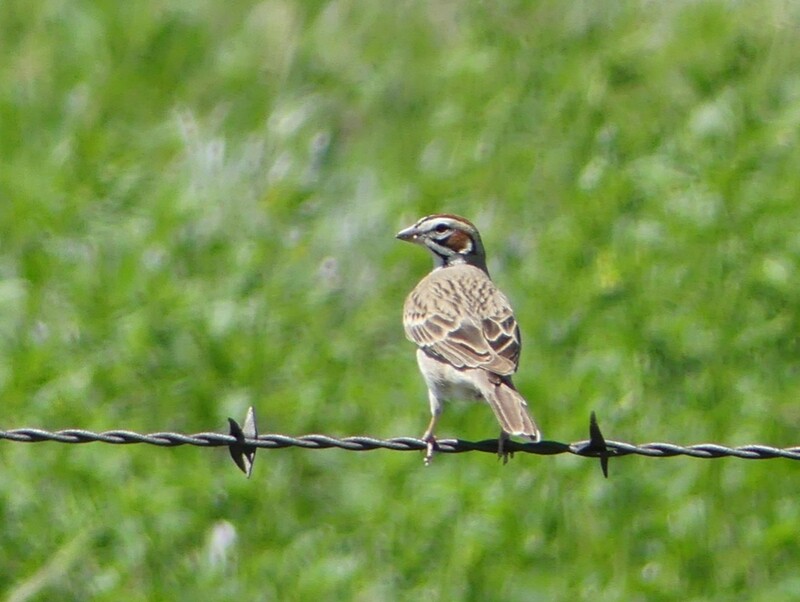 I’ll leave you with a Lark Sparrow that I saw yesterday when I detoured down a random dirt road. And, now I’m back on the trail, slowly heading home. On Thursday morning, I got “permission” from a local Montana birder to try Bannack Bench Road again when I called for advice. “The roads dry quickly and the storms don’t usually come until late afternoon.” So, I hoped to hit a sweet spot in the middle of the day. The beginning of the road was great, but it soon starting getting sticky. But, I heard birdsong, so I just pulled over and shut the engine. I continued to hear the bird and then I found him at the top of a distant bush with his head thrown back in full song. I hoped that this was a Gray Flycatcher, so I made a couple of quick voice recordings and tried to get a photo, but my camera wouldn’t focus. Before had time to play with camera settings, a local rancher came by and stopped to see if I was OK. He said I should be OK for another mile or so, but that I should turn around at the next cattle guard. Then we talked for a while, about how he loved Montana, how he is trying to save the Greater Sage-Grouse on the land he uses, the local roads. I showed him an illustration of a Prairie Falcon and he was sure they were “just over the ridge there.” But, of course, that was an inaccessible location for me. I can’t regret the 20 minutes or so we talked, but after he left, I could not re-find my singing bird. Also, storm clouds gathered while we were talking and he left me with instructions to turn around right then. If I got stuck he would have helped me, but I would have been embarrassed by my foolishness. The rancher told stories of people calling for a tow truck and being asked if they had a good book. At least one person was stuck for over 24 hours. Friends, you may have worried about people, bears, or rattlesnakes, but the real danger out here is the roads. I reluctantly left Bannack and headed to Lewis & Clark Caverns State Park, where I arrived mid-afternoon. The park is beautiful and I wish that I’d had the time and energy to hike some of the trails or take the tour of the caverns. I explored just a little of the park before it started raining. I headed to Bozeman for the night. It was raining when I woke up yesterday morning and I half-way expected a call from Ron Farmer cancelling our birding. But, Ron picked me up as planned and we spent several hours birding from the car. Ron took me to his reliable Sage Thrasher spot and we did see one bird. The bird was wet and I didn’t really get a great look, but it was a lifer. We spent the rest of our time looking for Prairie Falcons to no avail. Ron dropped me back at my hotel and I took a nap. When I awoke, the skies looked a little less rainy, so I headed back to the spots that Ron had showed me that morning. After watching for Prairie Falcons for over two hours (mostly in the rain), I decided to go look for the thrashers again. I drove up and back the road in intermittent rain with just one brief sighting. 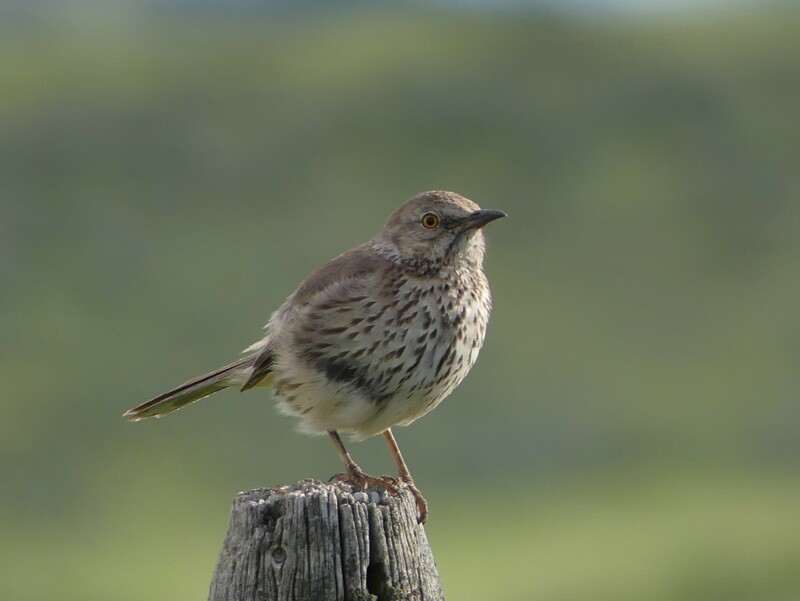 I started for a second round and immediately saw this Sage Thrasher perched on a fence post in a brief moment of sun. Thrilled that I finally had a photo, I headed back to my hotel and started thinking about today. 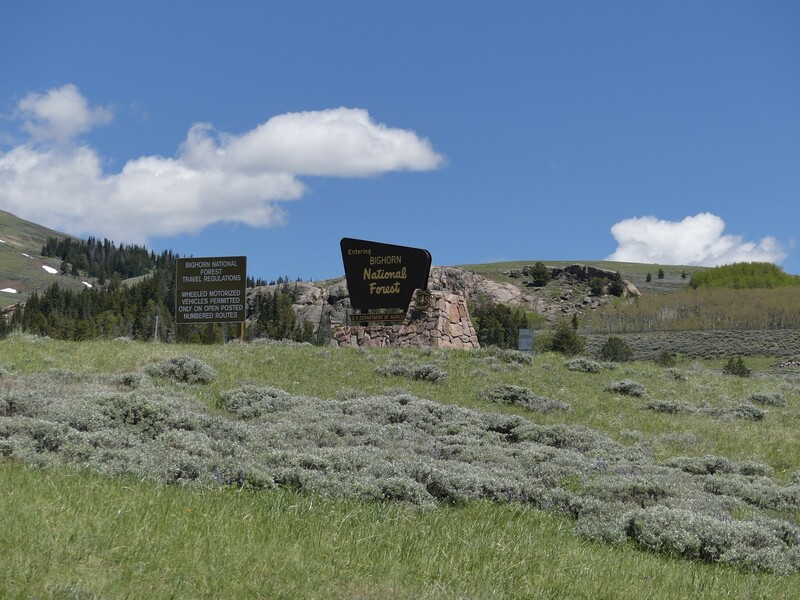 I had planned to drive the Beartooth Highway and look for Black Rosy-Finches at the pass, about 10,000 feet of elevation. I expected them to be right by the road. But, I started thinking about whether or not I would be comfortable driving the road and googled “Is driving the Beartooth Highway scary”? Well, the answer is that yes, for me, it would be as I am terrified of cliff edges. I have no idea why I did not think about the narrow mountain road with steep ascents and decents and hairpin turns before the trip. I fell asleep with no plan for today. This morning, I decided that I would check Bear Canyon Road in the Pryor Mountains for Sagebrush Sparrows. It took a while to drive from Bozeman, so I started down the road at 12:30 PM. 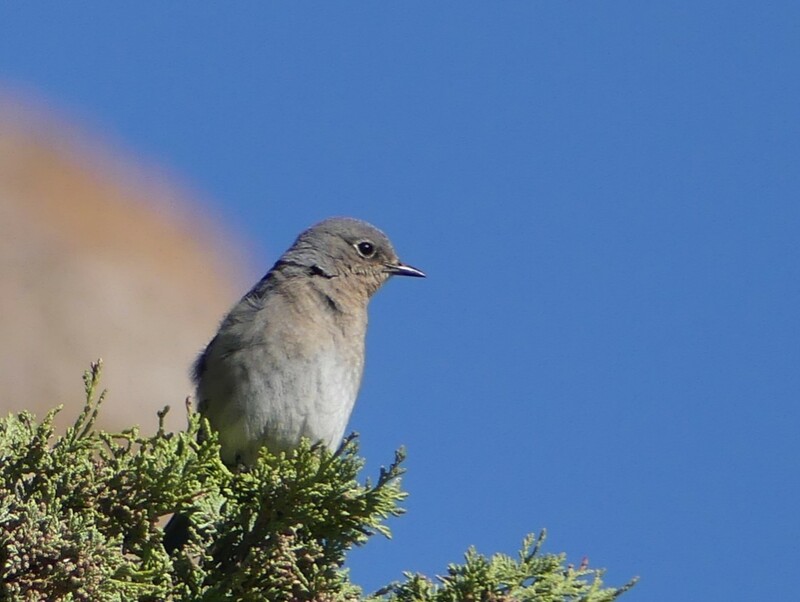 I did not find the sparrows, but I did receive confirmation from an expert that my recording from Thursday was indeed a Gray Flycatcher, another life bird. Bear Canyon Road was another of those isolated spots that I love and I enjoyed it. Here are a few images from this afternoon. A bird that reminded me of the Southeast US. 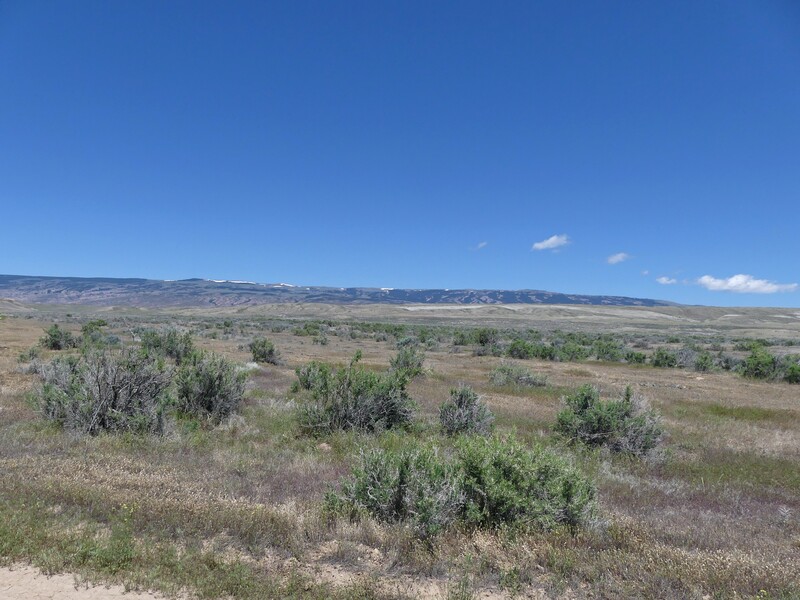 A view of the Pryor Mountains. Yes, that is snow on the peaks.